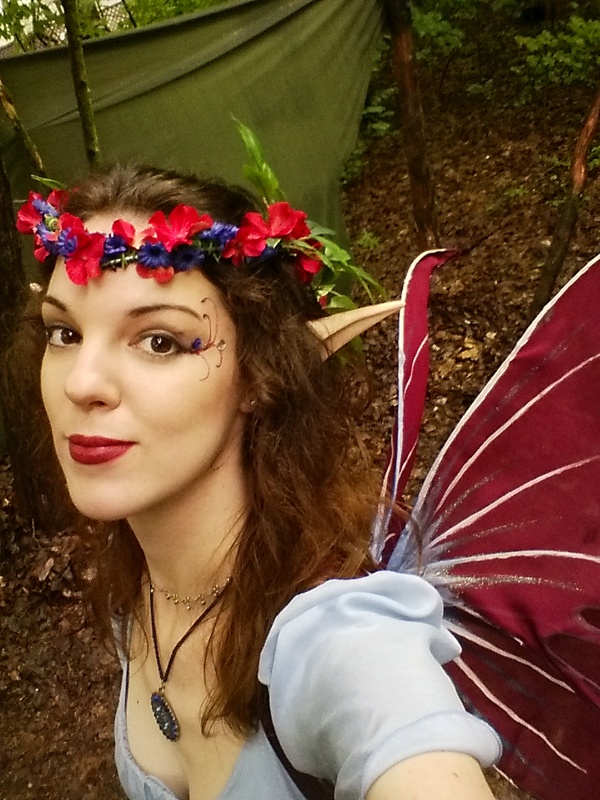 Part 9 of the Construction behind my Shannan, the Daughter of Allon costume. 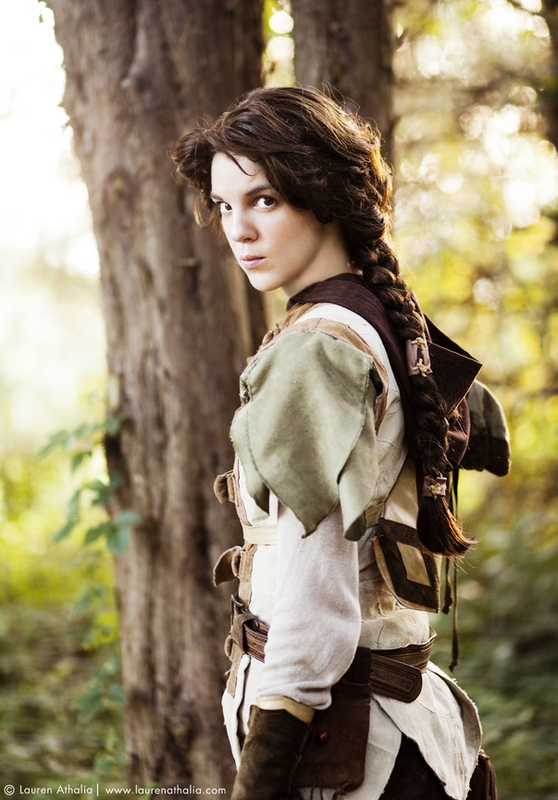 I knew I wanted a wig for my Shannan costume as my hair is very very fine, thin, and there’s not a lot of it. Shannan, on the other hand, has thick hair. In the book it’s written that Shannan wears her hair in a large braid. Well, I can guarantee you that when my hair gets put back in a braid it’s about the size of a rat’s tail. Seriously. So I decided to save myself the embarrassment and get an actual wig. Now since this was the first time I had ever worn a wig for a costume, I was going to need a little extra help. 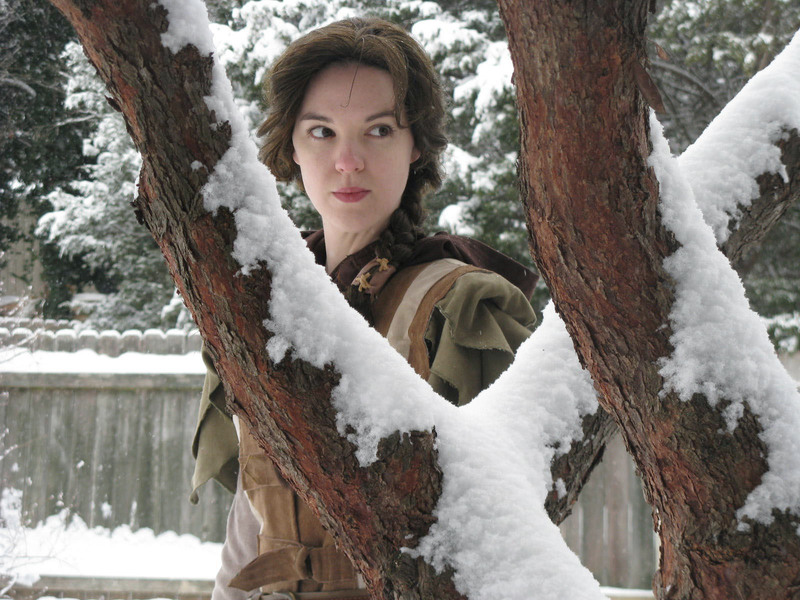 In January 2011, we actually had a real snowfall in Nashville! 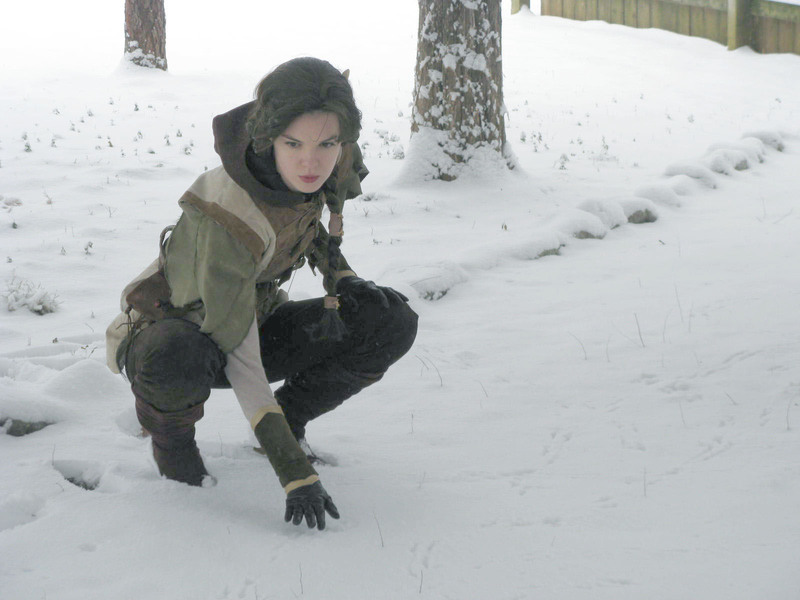 (we tend to only get a dusting every so often) So while everyone else was lobbing snowballs and building their snowmen (alright, so I did kind of build a snow Yoda…), I decided to grab my costume and head outdoors for a little fun photoshoot with my mom. Here you get the see the wig in action! 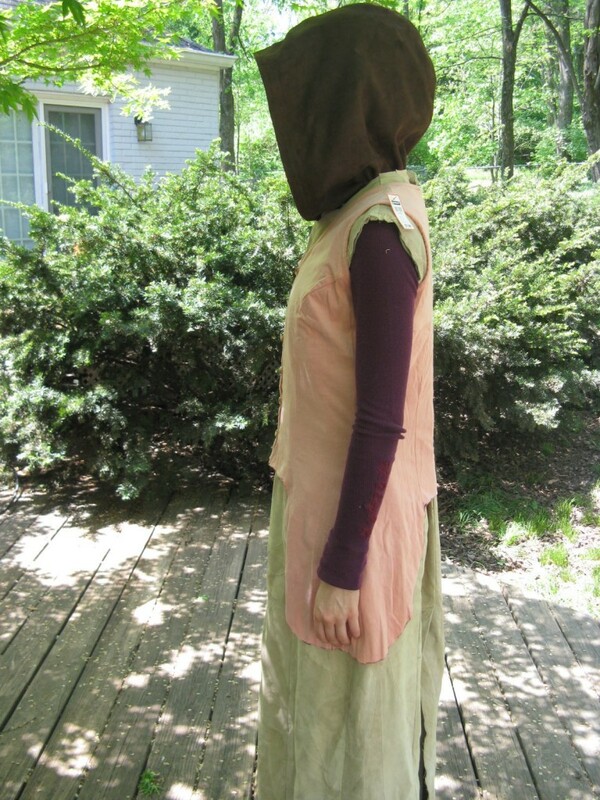 Part 8 of the Construction behind my Shannan, the Daughter of Allon costume. I had sketched out a number of designs for a pouch, but Mrs. Elrod happened to find a neat looking pouch at a yard sale. While I didn’t see it as very functional for Shannan, we were beginning to run out of time to find a suitable alternative (and as it turns out the pouch was perfect to hold Mom’s business cards and Allon bookmarks at conventions). We detached the colourful bits and baubles, save a couple light berry coloured ones that matched my belt and a neat hair tuft from the middle (part of a turkey beard perhaps?). 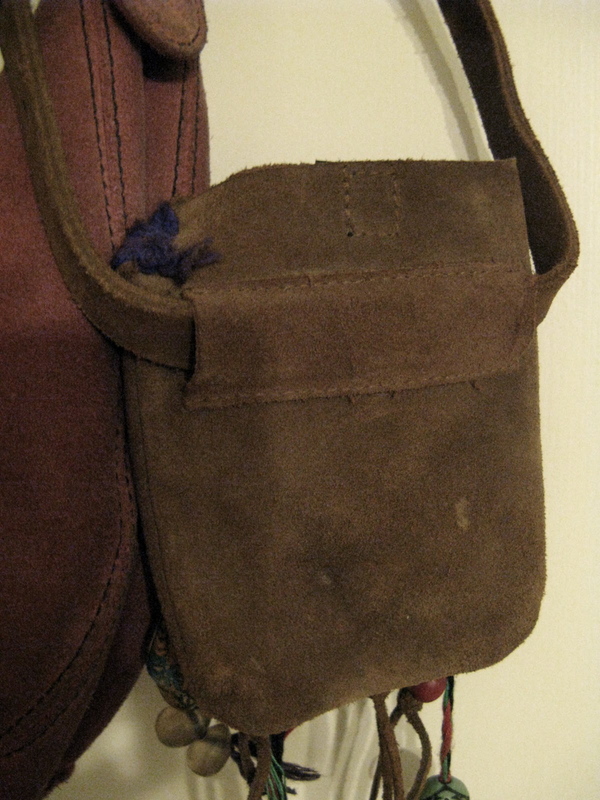 The front side of the pouch had a long messenger-bag like strap with no real way to close the pouch except for a small velcro patch on the front pocket. Mrs. Elrod cut off the long strap and instead made two smaller straps in the back like loop holes so the pouch could then just slide straight on to the belt. 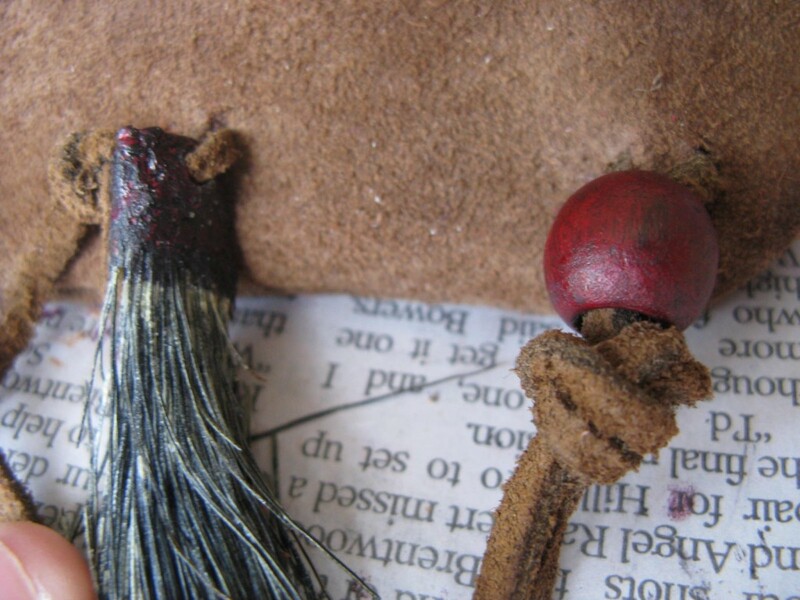 Mrs. Elrod suggested taking one of the light berry coloured beads, attaching it to the front, and wrapping a small leather strap around it to ‘close’ the pouch. The colour was fading off the bead, especially on one side so I grabbed a marker and went to town! 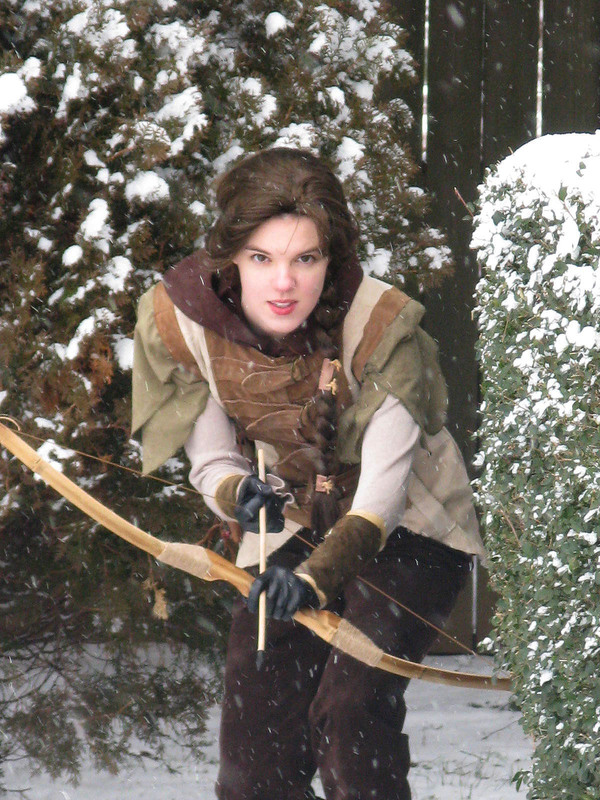 The same process happened with the wineskin – found in a yard sale and then painted to match the rest of the costume. 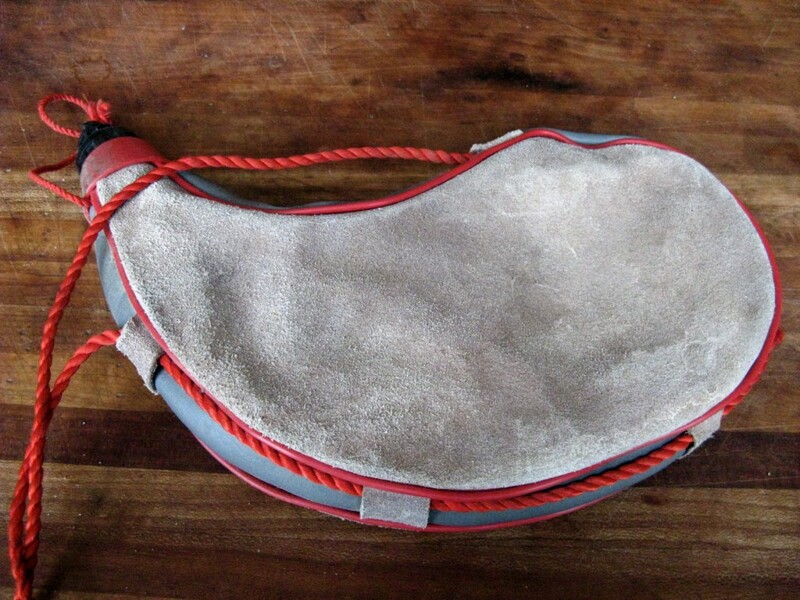 Sadly, the wineskin, while aged and distressed, was a modern plastic grey and red. 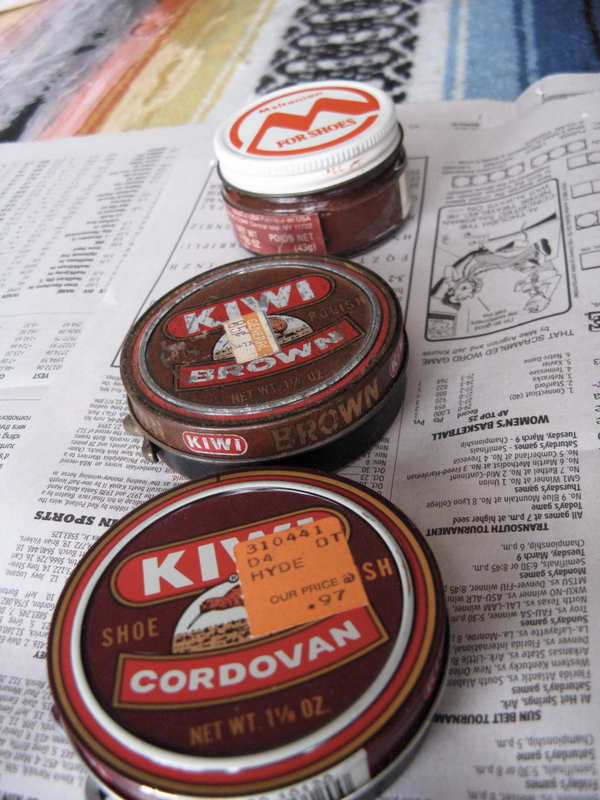 So out came the shoe polish! 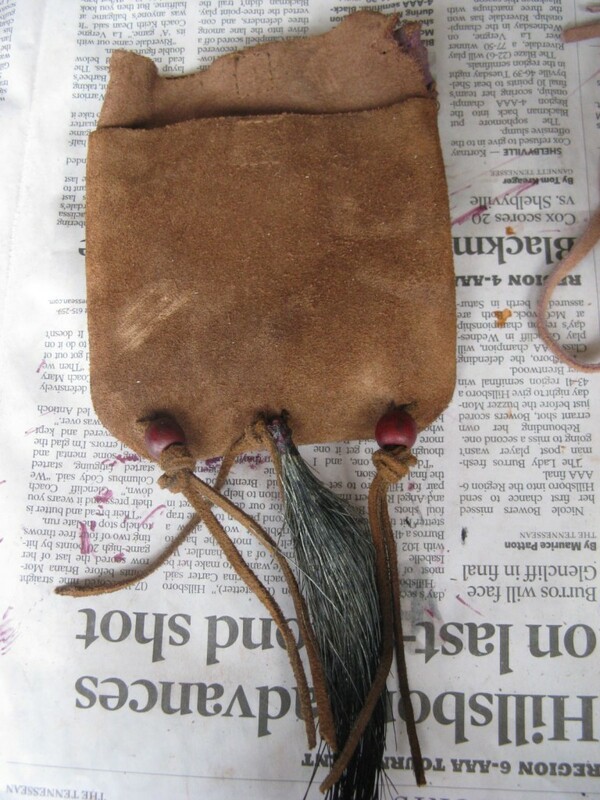 The leather part was fairly easy to buff to brown, but the plastic parts were a whole other story…I tried putting on a mask and painting the grey with mark like I did the beads on the pouch. But the plastic was slick and the marker ink wouldn’t stick worth anything. 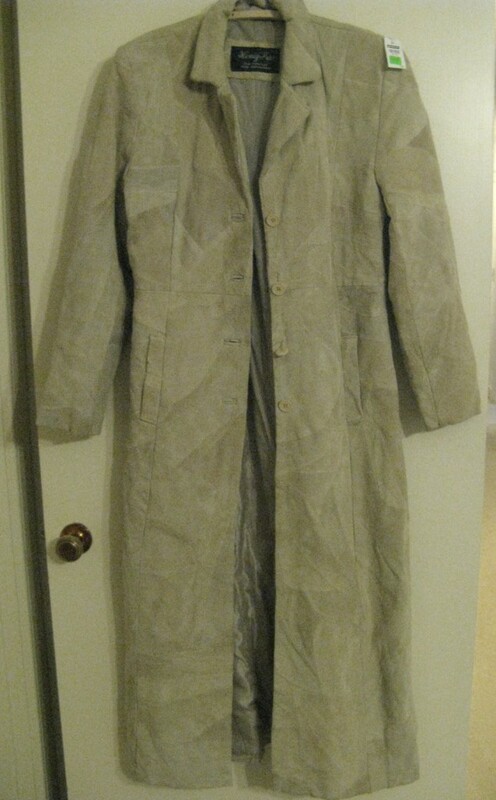 I ran the marker dry trying to put coat after coat on but grey still shone through when it dried. Thankfully Mrs. Elrod came to my rescue with a brilliant idea. She took one one of the reject belts (for my main belt) and threaded it through like a strap. It ended up working great as it covered the grey as well as wrapping it around the red, blatantly plastic cap. 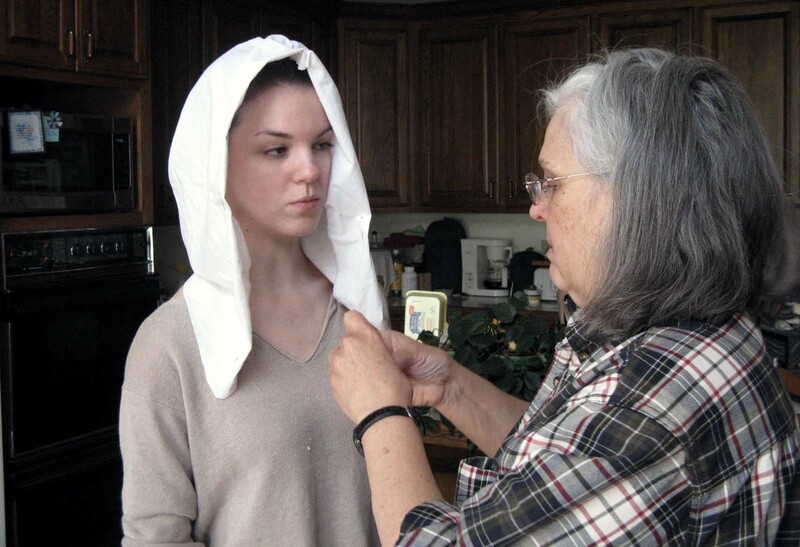 Part 7 of the Construction behind my Shannan, the Daughter of Allon costume. Since Goodwill tends to have belts for around $1- $1.50, we grabbed a number of leather belts to try out. The middle belt ended up being the winner. 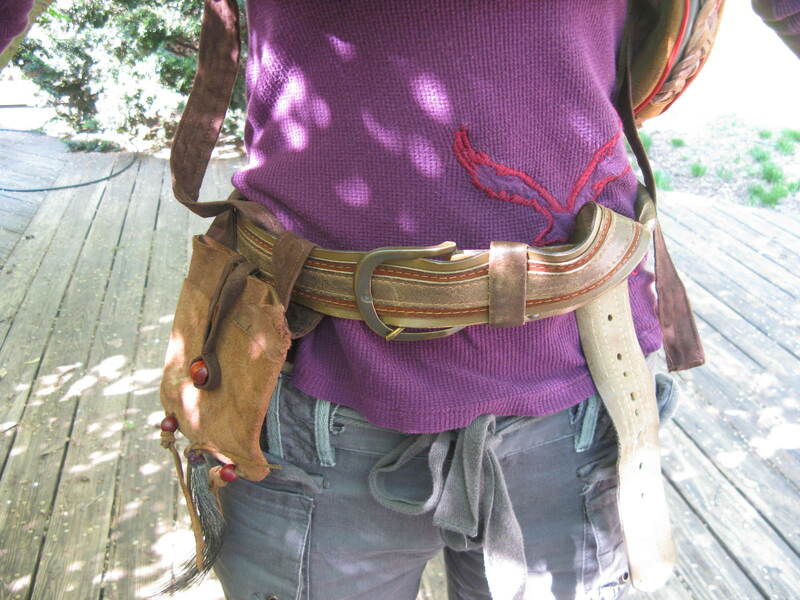 Rather than being the typical one, maybe two-toned belt, this one was multi-toned and multi-layered. It had a gorgeous rich dark red running the length of the belt next to the cognac brown. And being used, it already came pre-distressed! The belt was way too big for me but we had no leather-punching tools, so we decided to just play around with wrapped the belt around itself. It’s worked every time since! 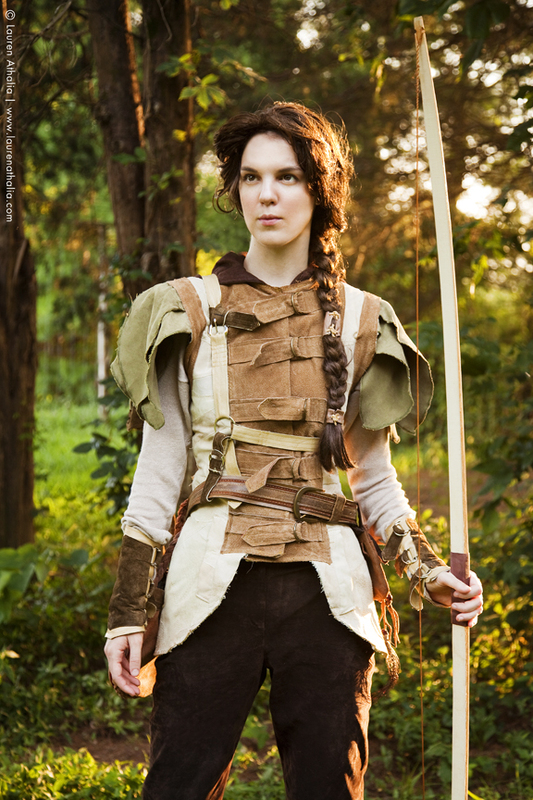 (NOTE: I knew nothing of archery when I did this costume, so the quiver is…well…quite lacking. 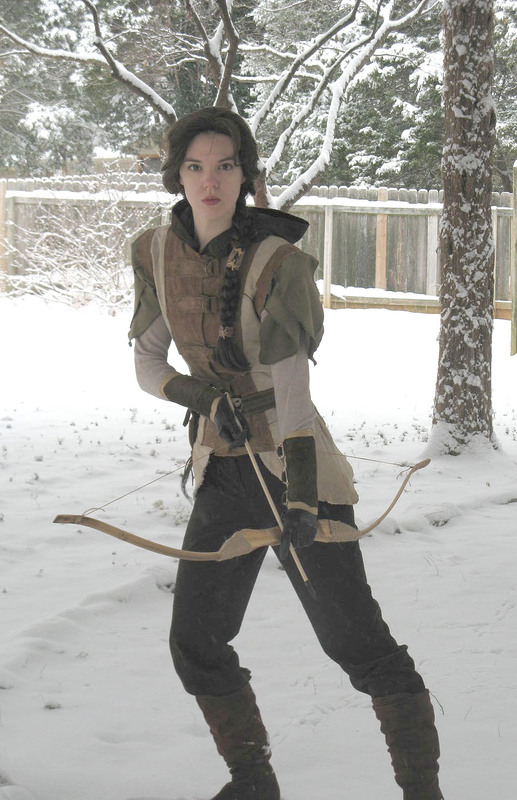 I corrected this ignorance when I did my Tomb Raider costume in 2013). 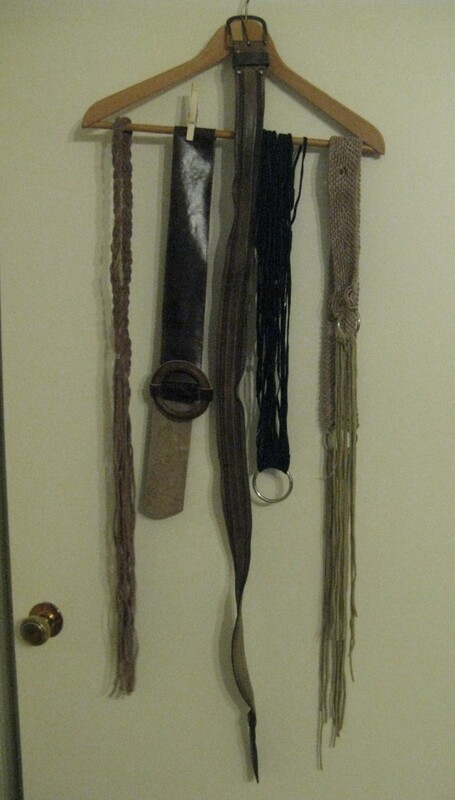 The quiver, on the other hand, was the exact opposite from the belt in terms of difficulty. 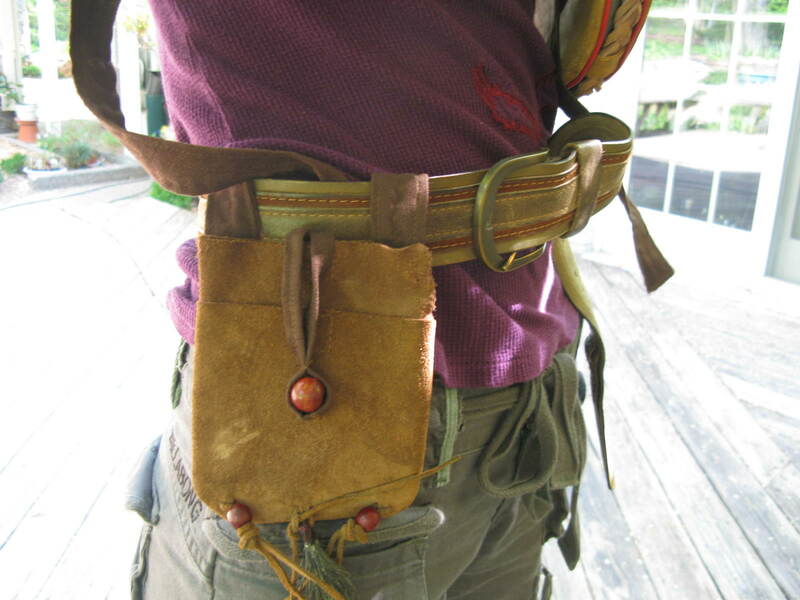 While the belt was easy as Easy Mac, the quiver was vastly more complicated. Like the bracers, I didn’t want to have the typical tube with arrows stuck in it. 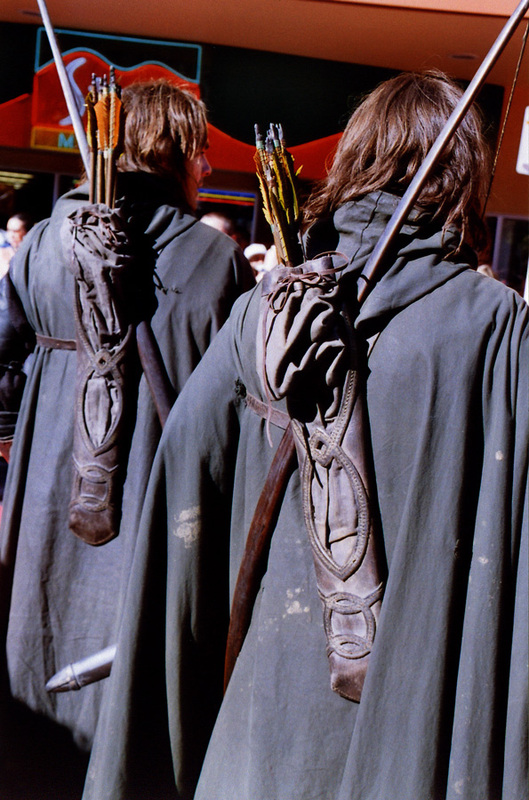 I turned again to the Rangers of Ithilien and found their quivers to be both functional, different looking. 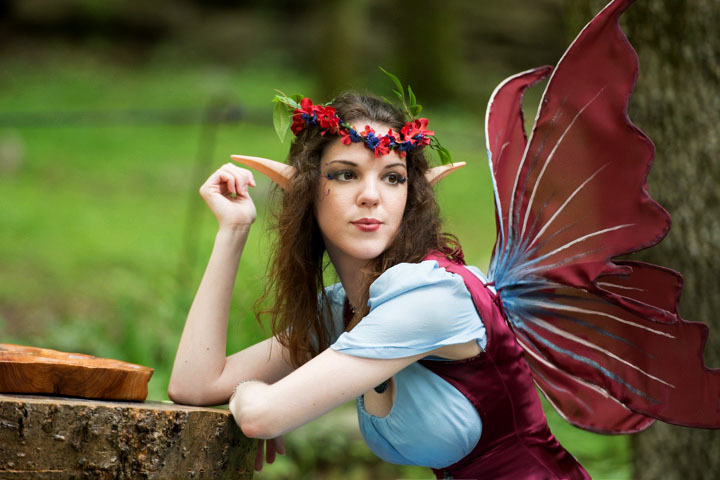 However, I had no idea how the craftsman at Weta created them, so I had to come up with my own method. After deciding upon exact measurements, my dad and I created a quiver template in Adobe Illustrator. 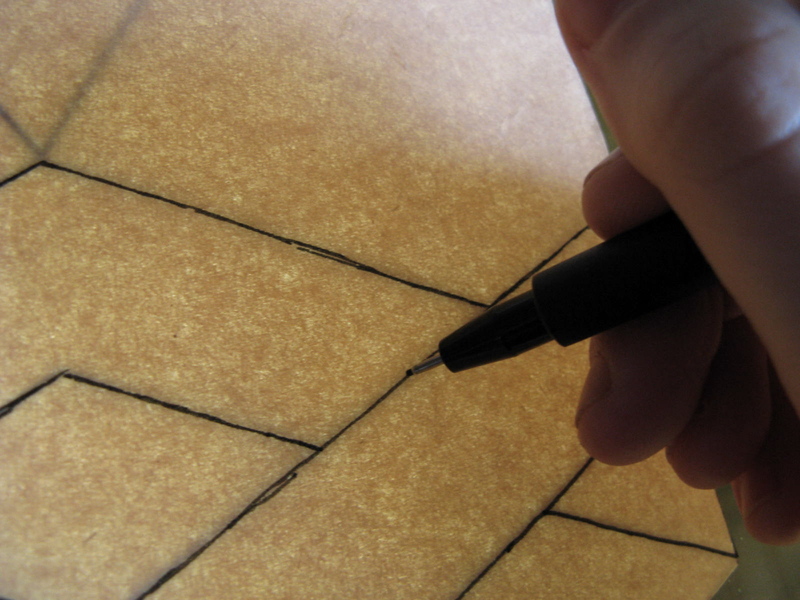 I then traced the template onto paper Mrs. Elrod gave me to use for a pattern. 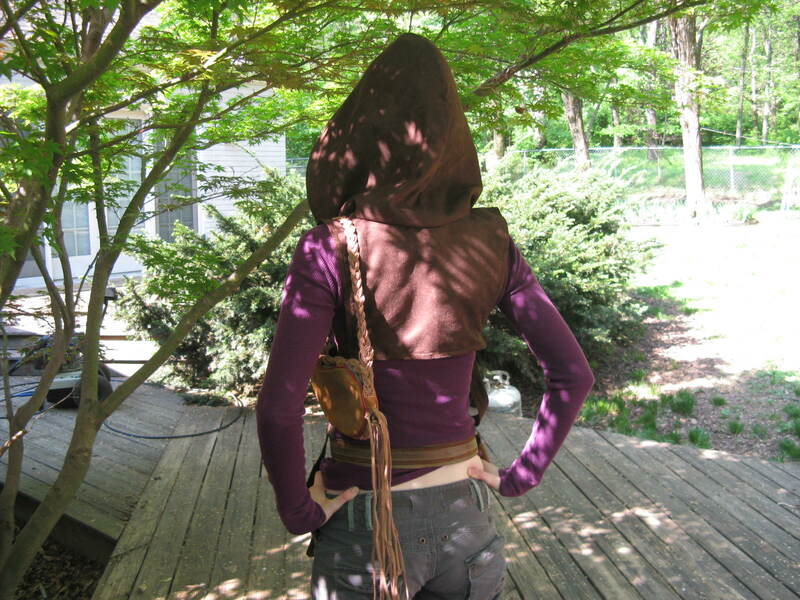 I then cut out the middle diamond of the exterior of the quiver as the arrow bag would show through it. 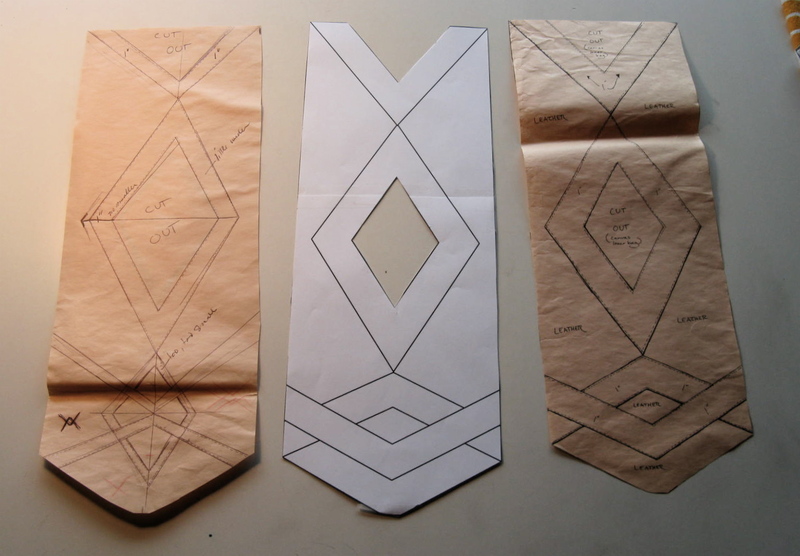 Afterwards, I traced the template onto the pattern paper and labeled it accordingly. 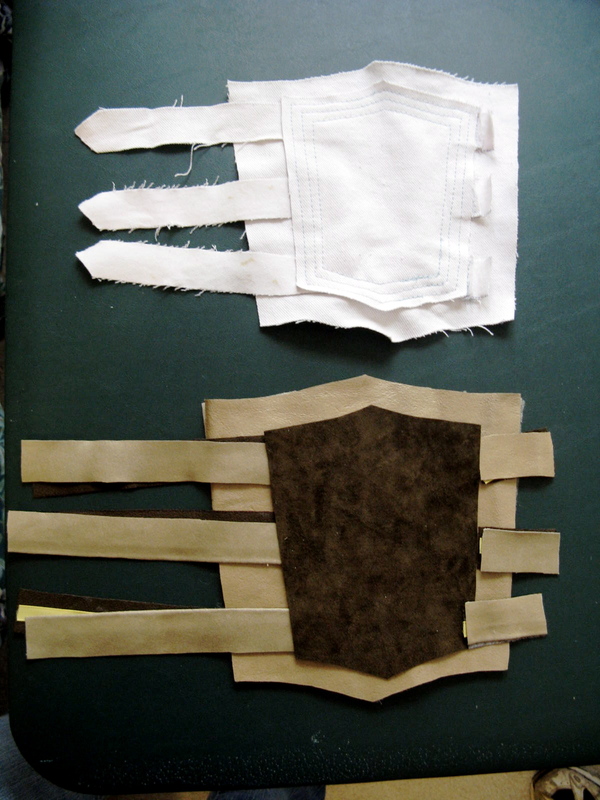 Mrs. Elrod constructed the quiver out of the same material as the bracers. Unfortunately the diamond hole in the middle was abandoned as the seams ended up needing to be wider to support the stitching in the leather. Straps were attached, but something got miscommunicated from design to construction so the quiver ended up not being functional. 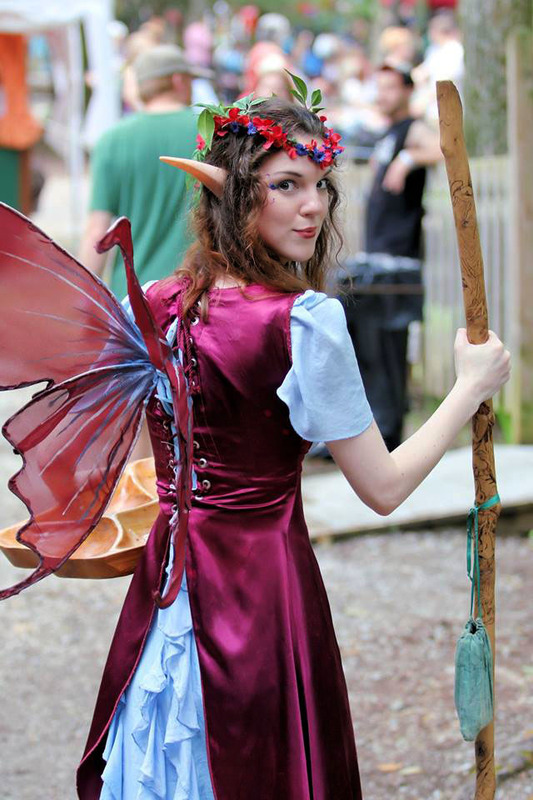 I still kept the quiver in the final photoshoot as it wouldn’t make much sense to have a bow and arrows for props but no quiver. 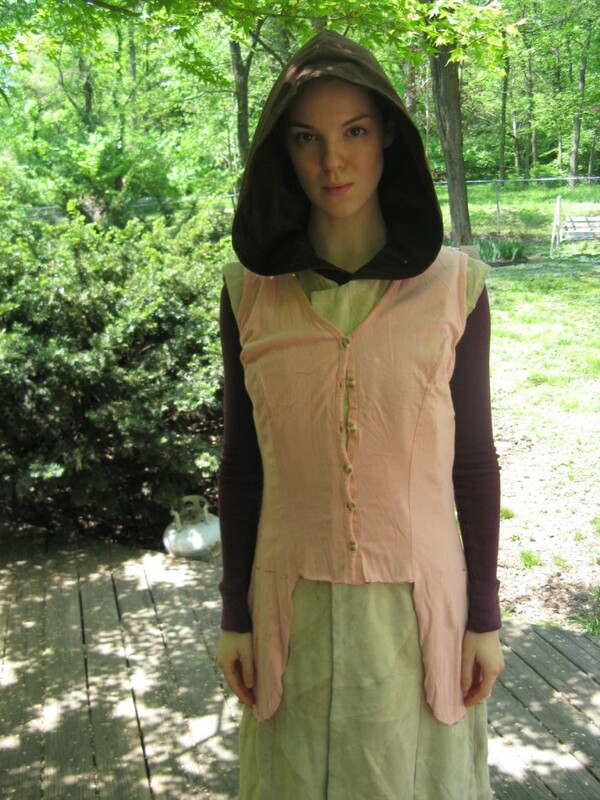 Part 6 of the Construction behind my Shannan, the Daughter of Allon costume. 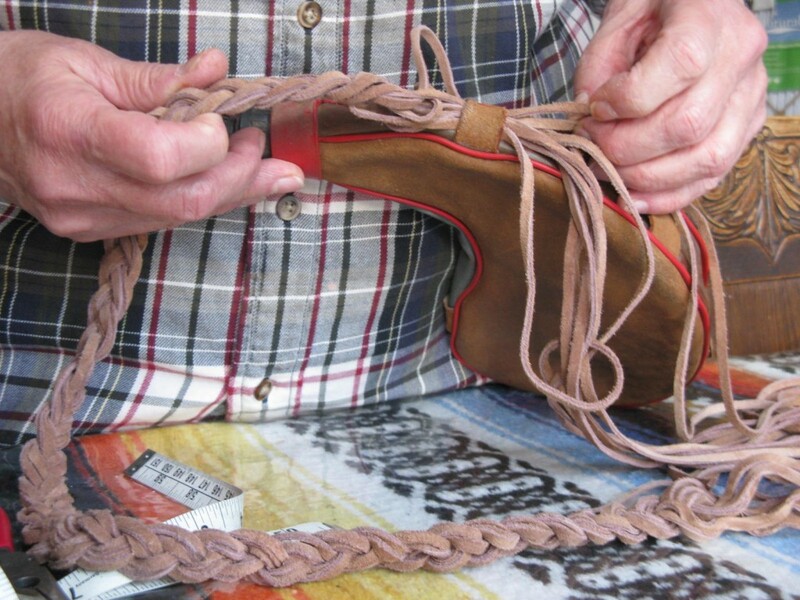 Surprisingly there’s very little to say when it comes to the construction of the pants and boots. Both were Goodwill bought with no modifications (with the exception of taking in the size 6 pants as I wear a 0). The pants are thick suede by Ann Taylor with a silk lining that is RIDICULOUSLY freezing when the temperatures dips below my beloved 70 degrees. 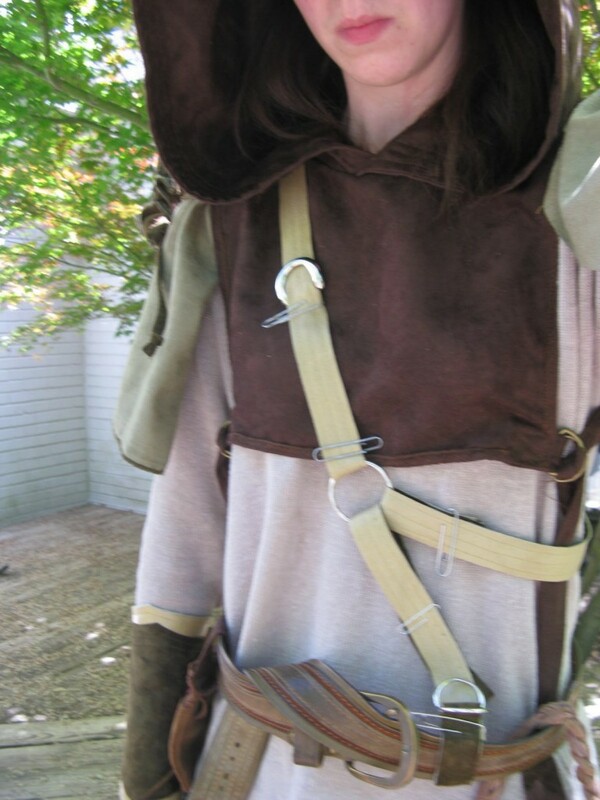 As far as the look I wanted for the pants, I took inspiration from Faramir in the Lord of the Rings films. 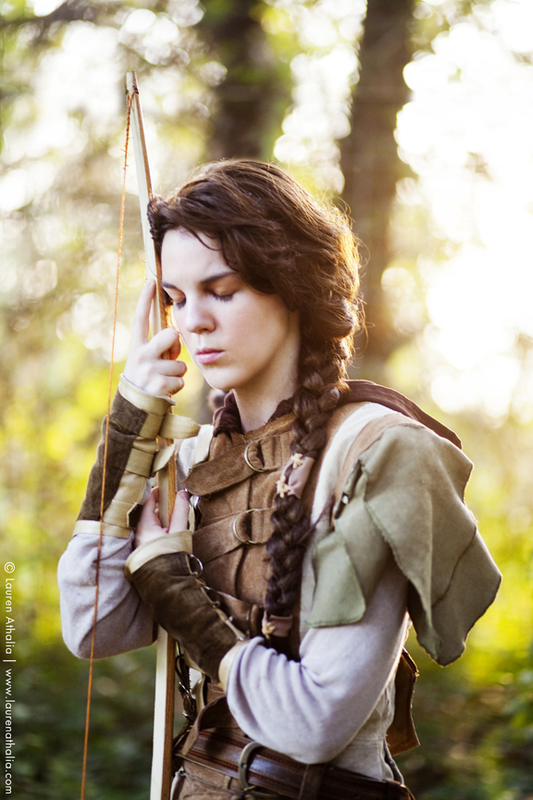 Truth be told, the Rangers of Ithilien were the primary inspiration for my Shannan costume. 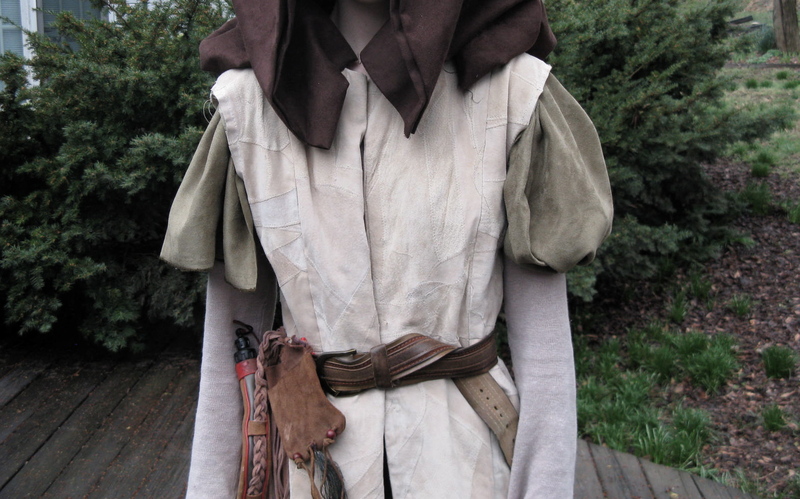 I really wanted to create a rustic, unique, but entirely believable costume so I took quite a few notes from Weta Workshop’s costuming department. 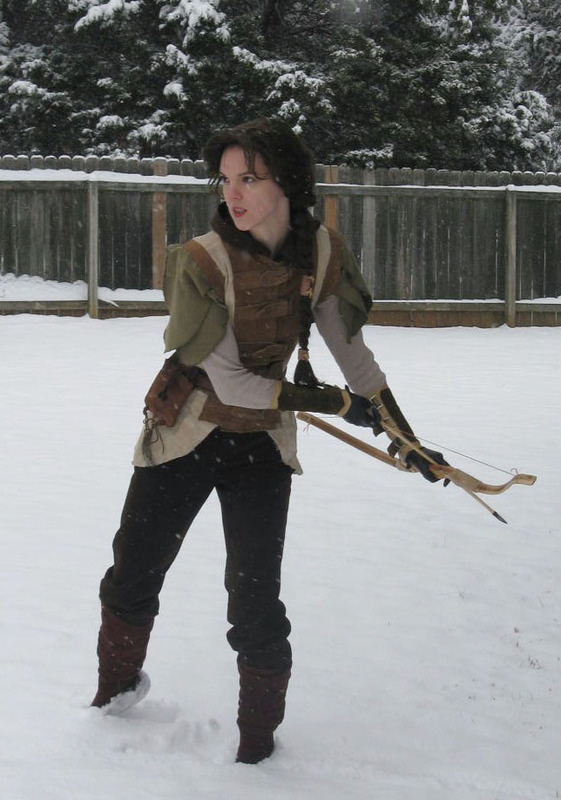 At first I opted for woolen hose or leggings (ala Legolas or Aragorn) until I put the jerkin on and realised that with its bulk the proportions looked off. So I went with the Ann Taylor pants. 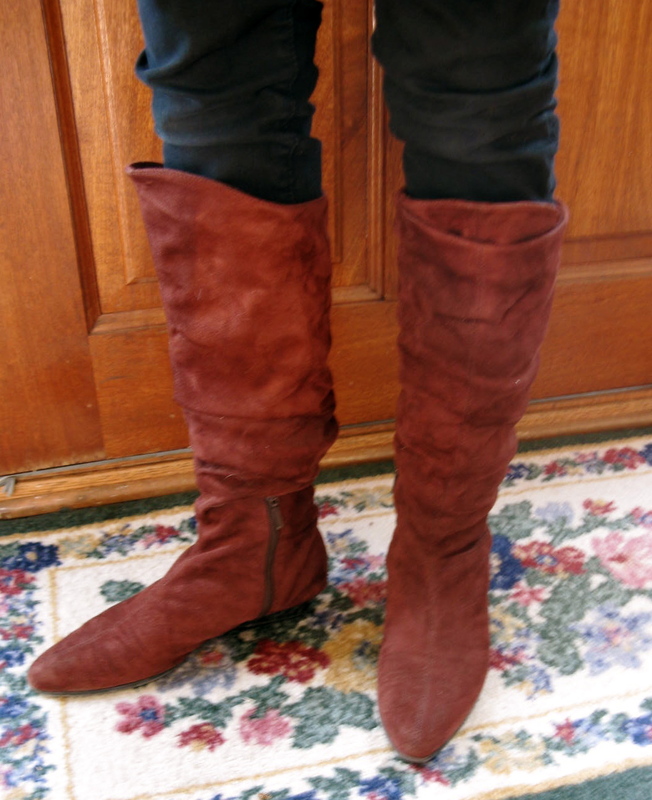 The boots are suede slouch boots with no apparent brand name. They’re definitely a wee bit snug, but they have a very interesting fitted foot shape not usually characteristic of tall boots. 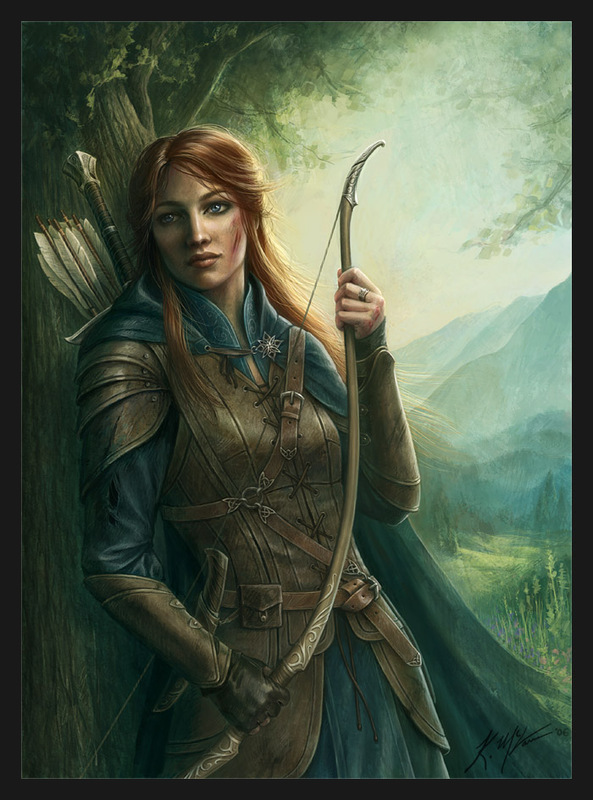 I originally wanted to go with something more along the lines of what Faramir wore, but I’m beginning to think there’s a conspiracy out there against making those kind of boots for women. 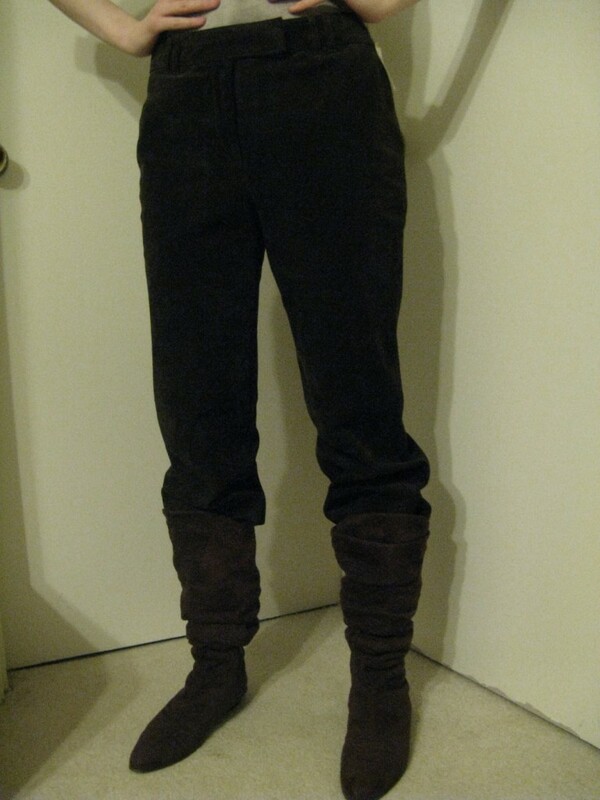 But as it turns out, the boots I found work best being similar fabric to the rest of the costume (and there’s no lacing on the rest of the costume, so that probably would’ve bothered me aesthetically). Now, for the actual boot colour! 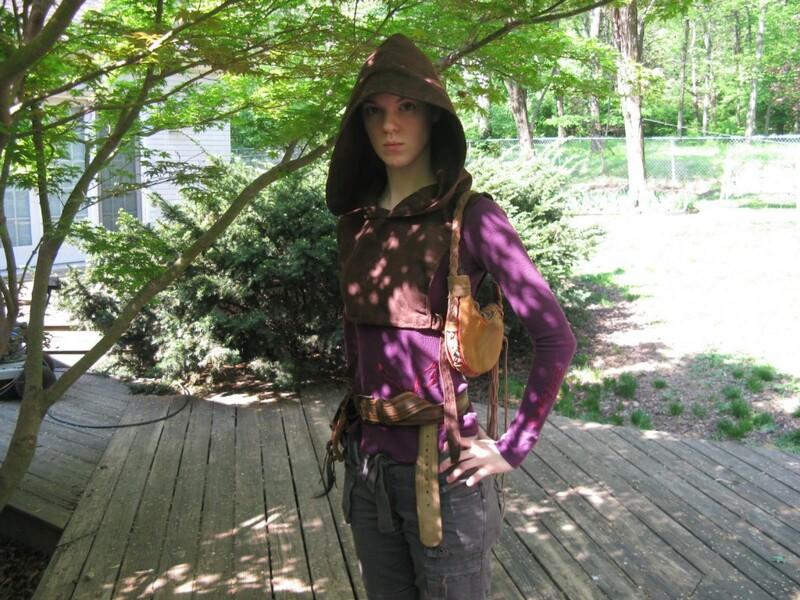 Part 5 of the Construction behind my Shannan, the Daughter of Allon costume. 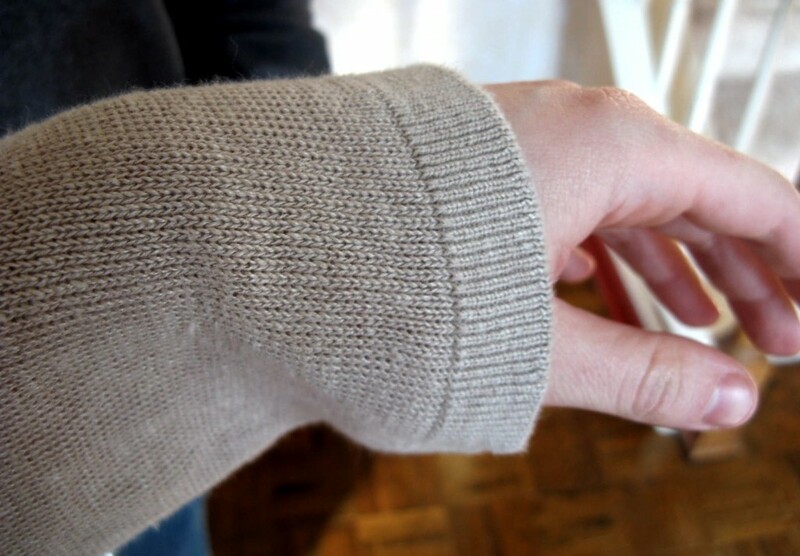 The flowing sleeves were purely for aesthetic purposes and attached to the jerkin itself. The idea behind them was three-fold. 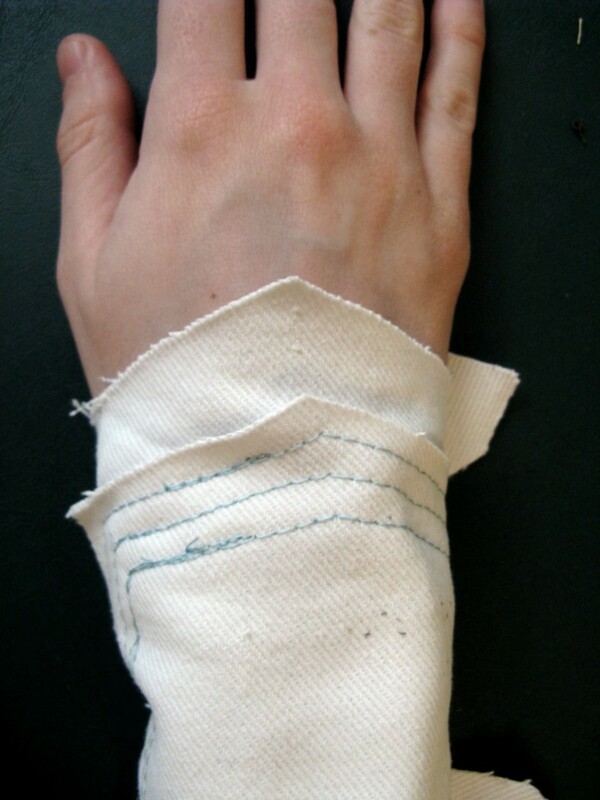 In the sketch, the sleeve was a full circle sleeve. Mrs. Elrod suggested we go for a half-sleeve instead, only attached to the front and back armpit of the jerkin. 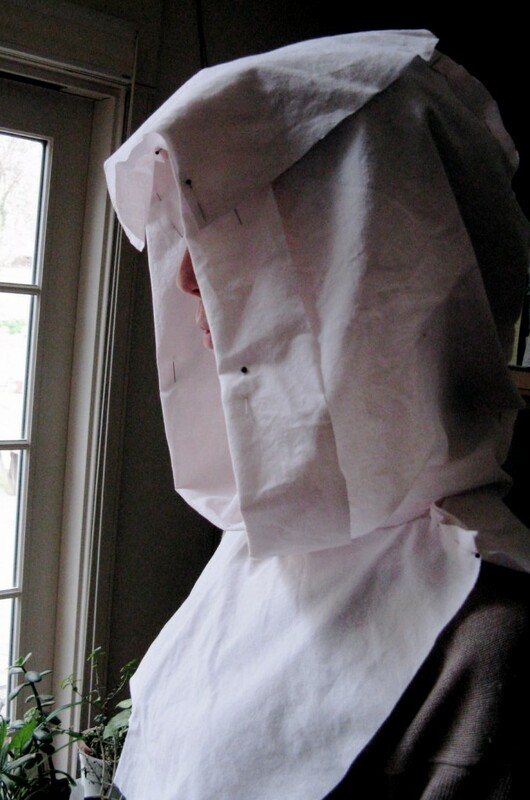 It would save a bit on fabric and keep from having more fabric that could potentially bunch up under the armpit. I agreed and we moved onto the next step. 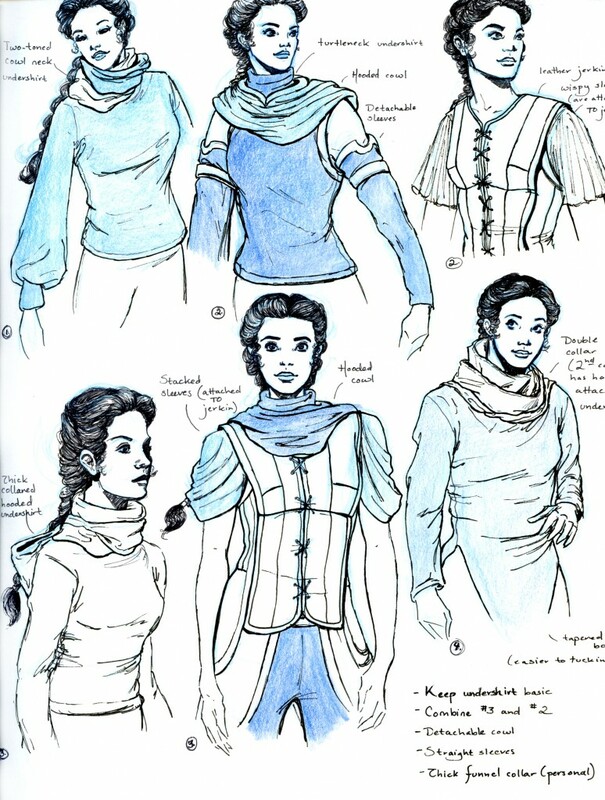 In the end we went with the pleat sleeve as the one of the right looked too courtly for Shannan’s costume. 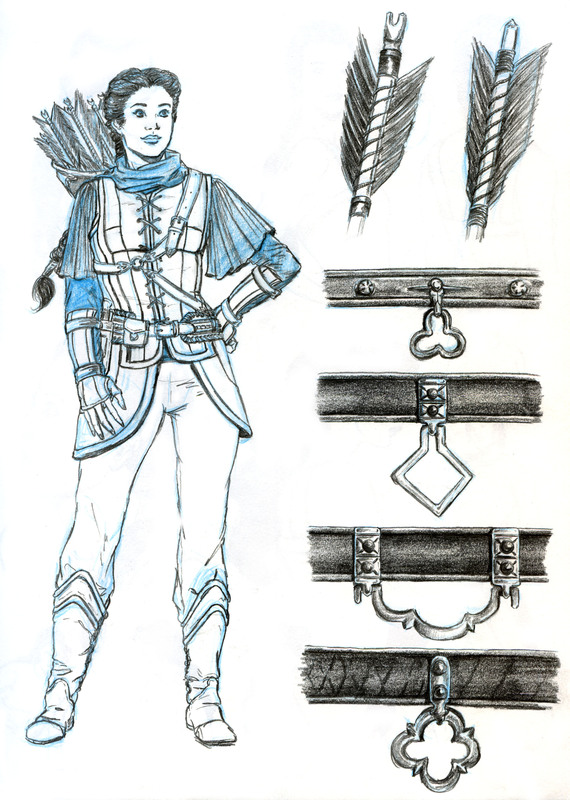 I had no specific design in mind for the bracers when I first designed the costume. 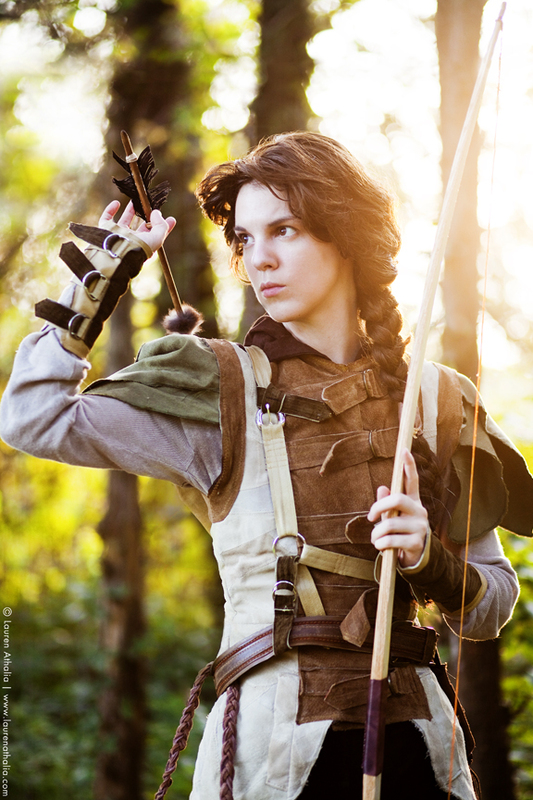 My knowledge of archery and leatherwork was nil. 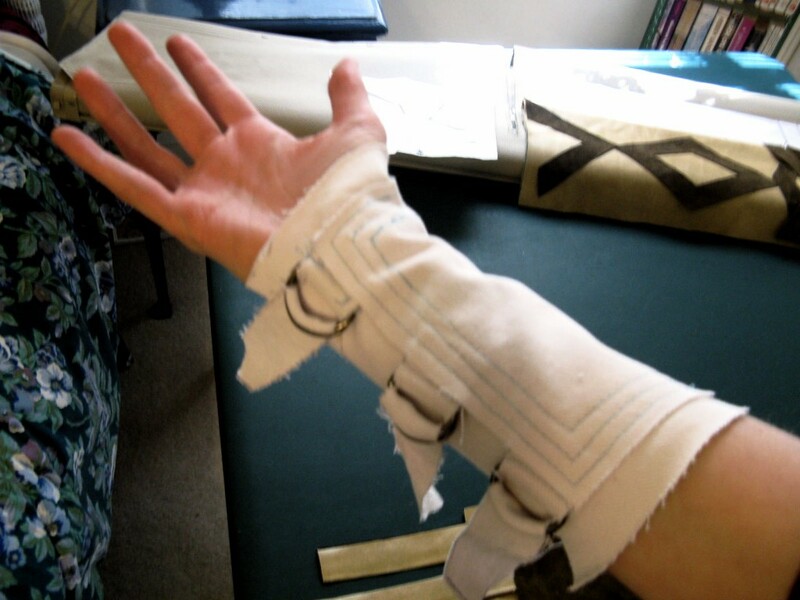 All I knew was that I didn’t want the tubed laced-down bracers that I’ve seen at renaissance faires. I wanted something more durable, more substantial, and a bit different looking. It was frustrating at first as all I seemed to be able to find were bulky designs made for muscle men and certainly not for a gal with a six inch wrist. To make matters worse, everything looked too clean, too modern. 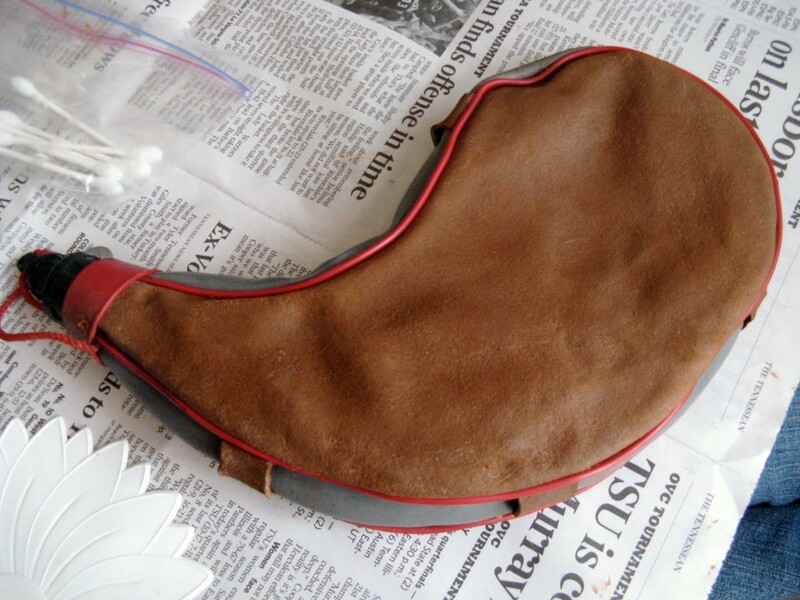 I finally turned to Deviantart as I knew there were some actual leatherworking artists under the costuming section. 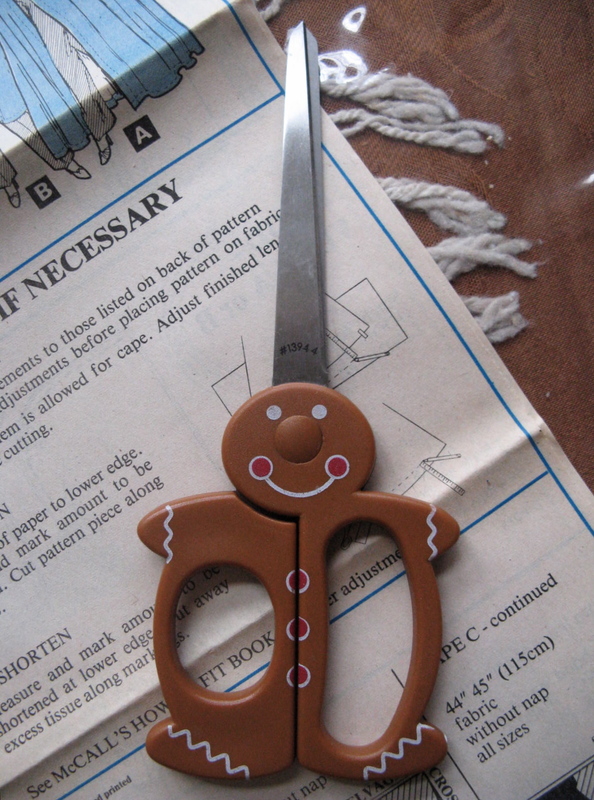 After a few hours of searching I came across a fantastic costumer leatherworker by the screenname of Sharpener (http://sharpener.deviantart.com/). I adapted a design from his various bracers. Mine was much more crude and simplistic, but it got the job done. Mrs. Elrod drew up her own sketch to jot down sewing notes. We decided to go for an extended triangle front on top of the hand to protect the wrist as well as to cover the archer’s glove on the right hand. 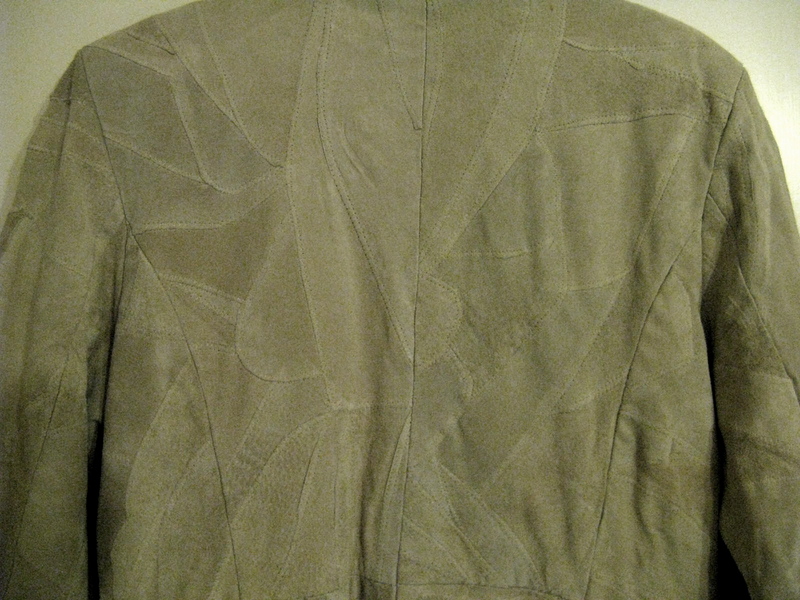 In addition, Mrs. Elrod added a triple stitch around the top panel. 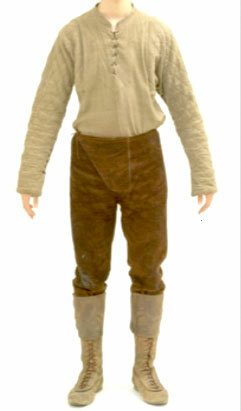 This tri-stitch is repeated through the whole costume. I then tried on the mock-up to make sure it fit properly. Thankfully, with the straps, it had enough room for the undershirt to fit in, but snug enough that it was form-fitting. Now here’s some amusing trivia on these bracers. Guess where the fabric came from! 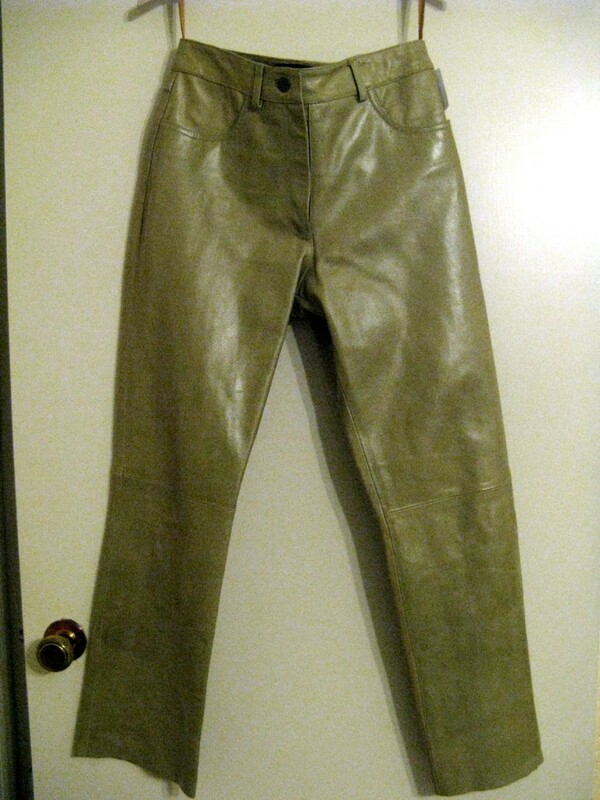 Yep, a pair of leather pants from Goodwill (and a suede skirt. 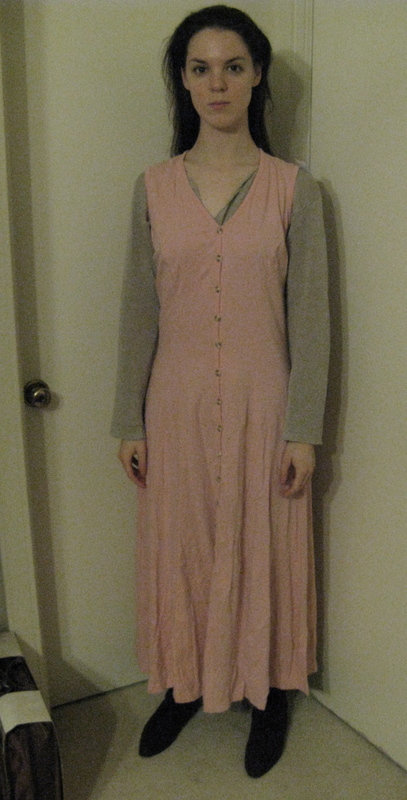 Alas I didn’t get a picture of the skirt before it was diced). The straps ended up being a little long, so we cut them in half. 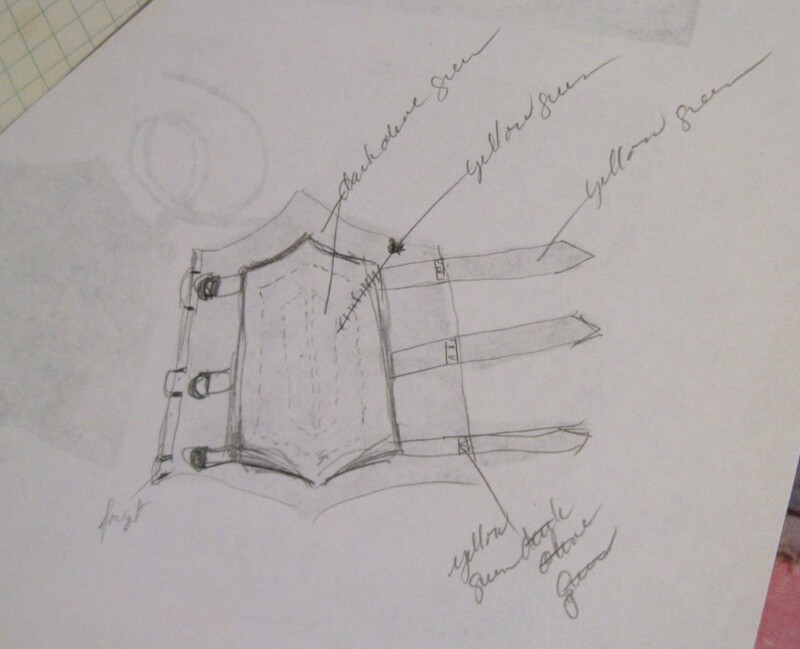 In addition, the straps themselves needed more weight to them as we were working with a soft, light leather and not a heavy duty one as most bracers are made with. 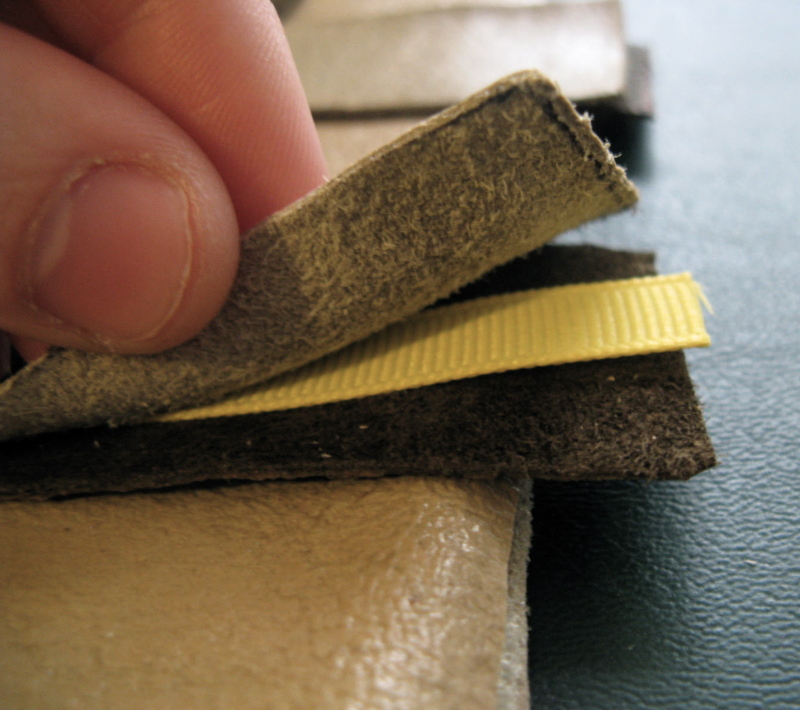 Mrs. Elrod placed plastic boning in the middle of the top layer of layer and a bottom layer of poly-suede. The layering gave a thickening effect and it made it easier to hold the straps down lest they slip through the D-rings if I decided to start flailing (which is almost guaranteed. I tend to gesticulate wildly sometimes. 😛 ). The next time I saw the bracers they were finished. I didn’t think to ask for a closeup of the bracers during my photoshoot, so here’s the closest shot (as well as the sleeves). 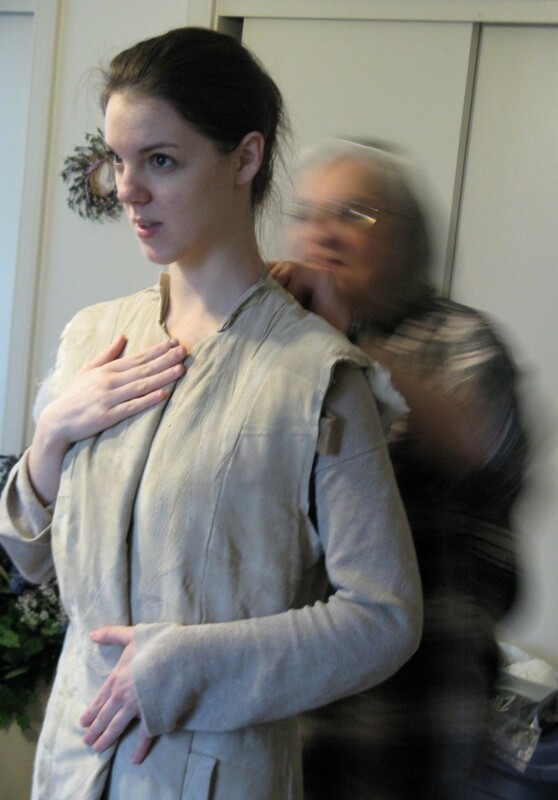 Part 4 of the Construction behind my Shannan, the Daughter of Allon costume. Sadly I cannot find the the artist who did this piece so I can give proper credit (if you know who did this, please leave me a comment so I can credit them!). I’ll admit that I copied down the jerkin almost exactly, mainly because I was trying to figure out how the artist designed it in the first place. The jerkin proved to be a tough little piece to do as shown in both the illustration and my sketches. 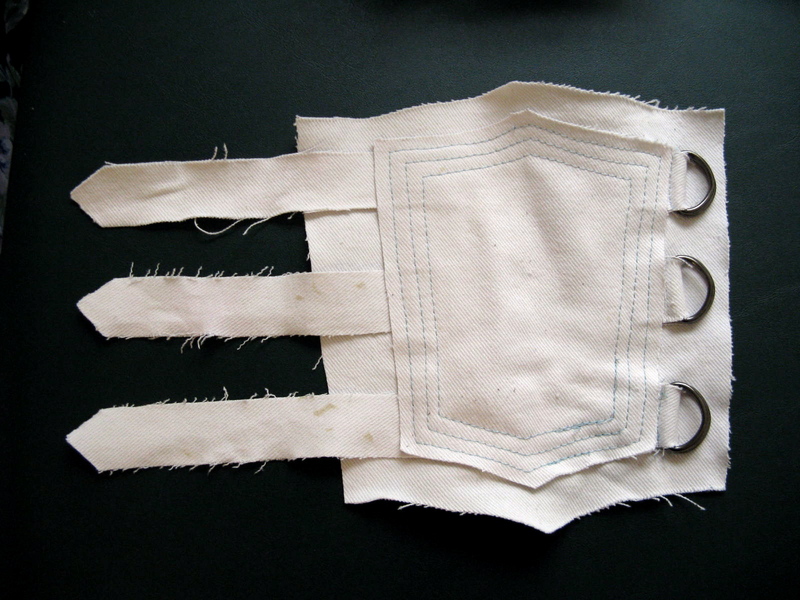 It’s all one piece (all the lines are seam lines) and goes over one’s body like a vest, pulled together by straps in the middle. In addition, I wanted the jerkin to be made out of leather, preferably a soft, supple leather. 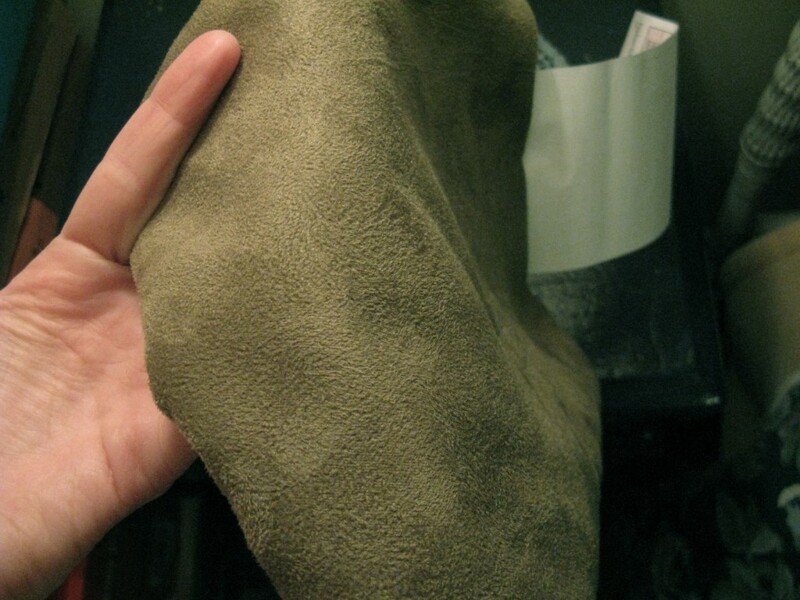 I looked at fake leather, upholstery leathers, even elk hide. But the prices were just astronomical for my meager budget. I was beginning to wonder if I would have to scrap the jerkin all together and go with something simple. But nay, I stuck to my guns. I wasn’t going to compromise the design and end up with something that looked like I just stitched it together for a romp at the local comic convention. I wanted this to be a screen-worthy costume. Mrs. Elrod came up with an interesting design for a more rustic looking jerkin with military-esque straps pulled across the body. I’ll admit it took a bit to talk me into it as it was such a departure from the designs I had drawn up. But it was between that or no jerkin at all and that just wouldn’t do. So I surrendered to Mrs. Elrod’s sewing expertise and away we went. The pattern, on the other hand, turned out to be a headache. It was nigh impossible to find a pattern anywhere near my sketch. We scowered through every pattern book we could find as well as online. I even bought a dress at Forever 21 that I thought might work, but ended up not being the right cut (sadly, I couldn’t exchange it back for cash to put towards the costume). 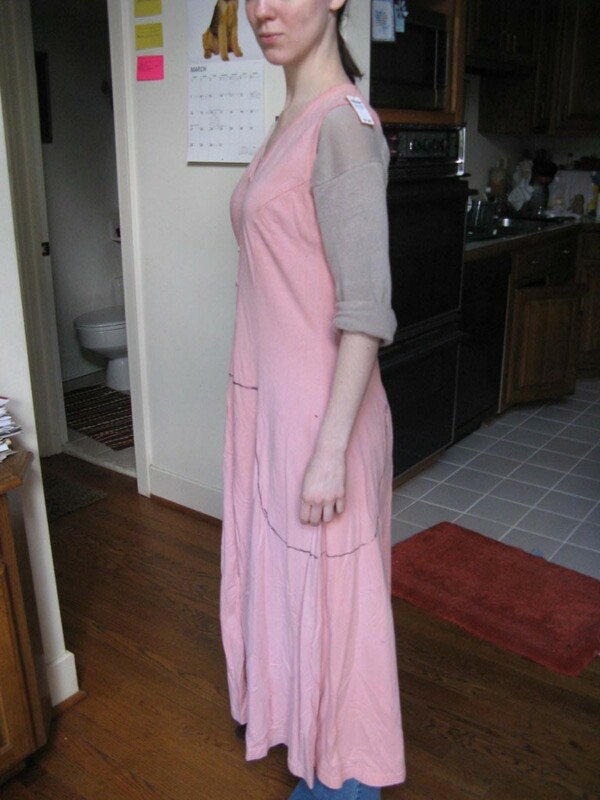 After a couple weeks of searching we returned to Goodwill and found a long dress that had some close seam lines. It wasn’t completely ideal, but it was the closest we could find. 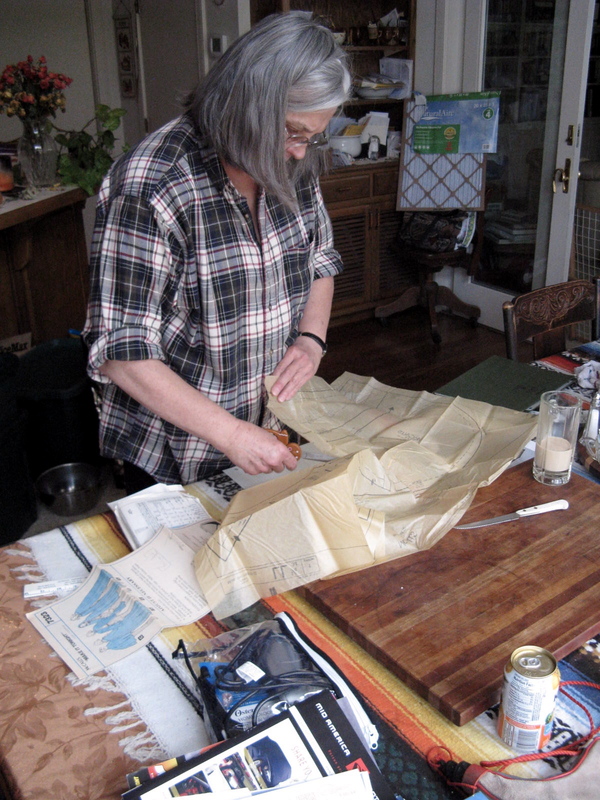 Using me as a mannequin, Mrs. Elrod drew the lines on the bottom of the jerkin that we would use to cut out the final piece. 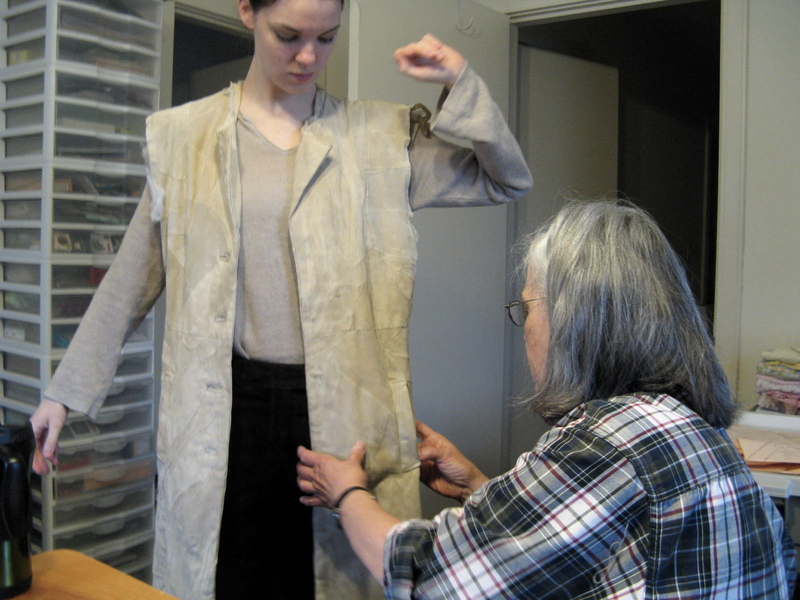 Mrs. Elrod then cut out the silken lining from inside the suede jacket and cut off the arms. When I returned the next day, we went to work on adjusting the coat to fit me. We also discovered that the coat pockets were cut shallow. 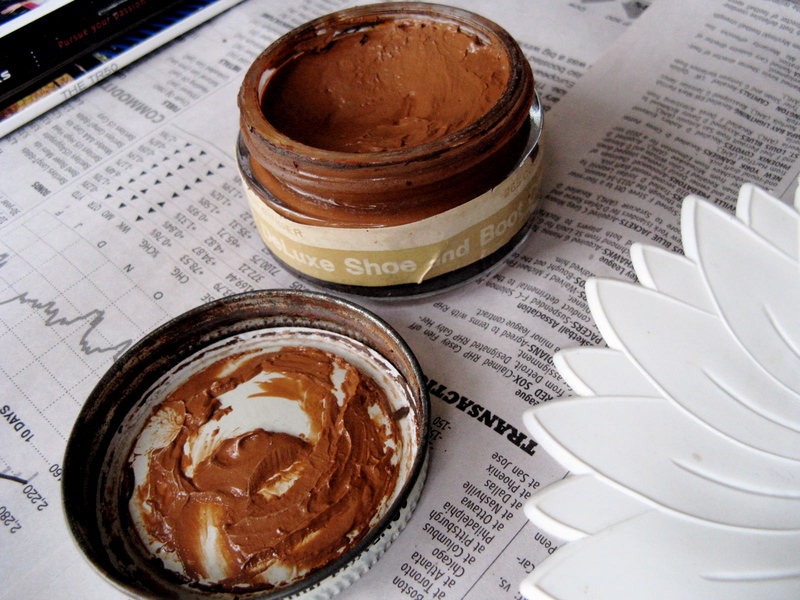 We weren’t sure what to do with them, so put them on the Do-Later list and continued on with the adjustments. 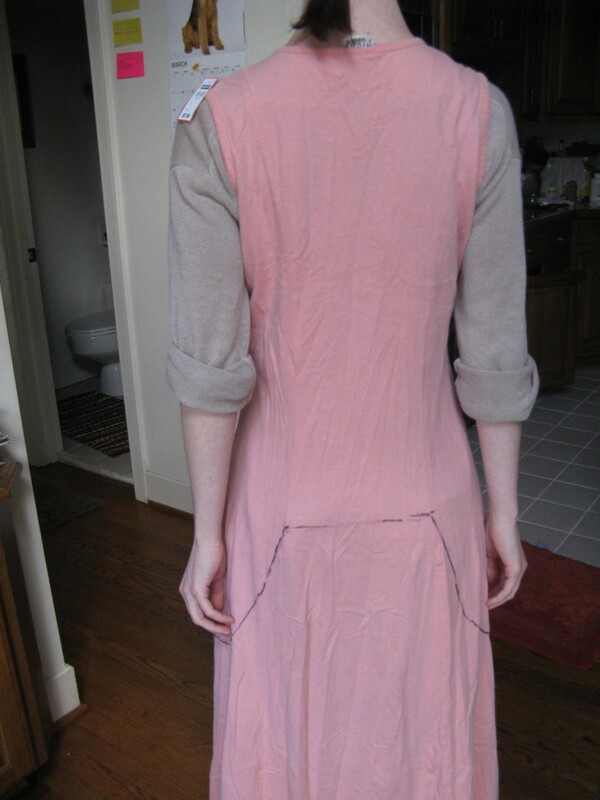 Mrs. Elrod then penciled in where the middle trim would run for the straps to be attached to. 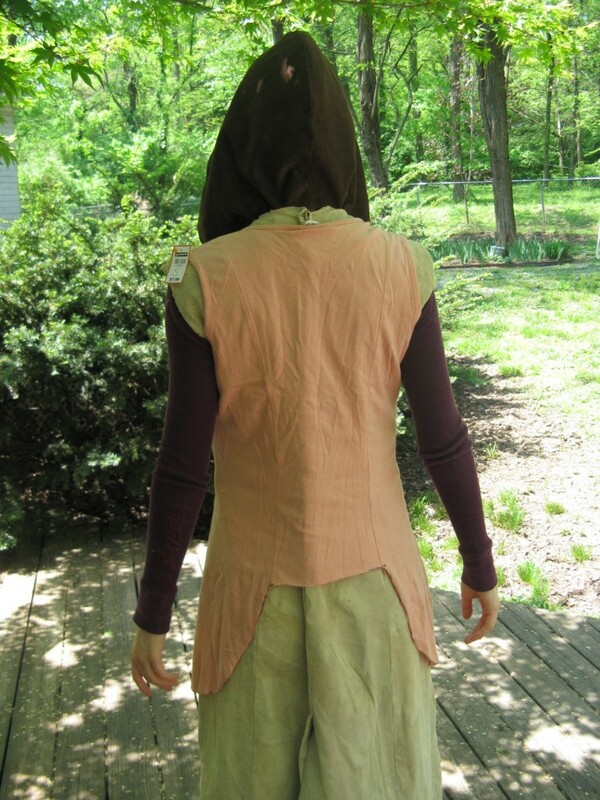 We adjusted the front middle and back middle seams to overlap (as stated before, the jacket is entirely too big for me). The sides were also taken in lest the dreaded ‘tent’ form under my arms. 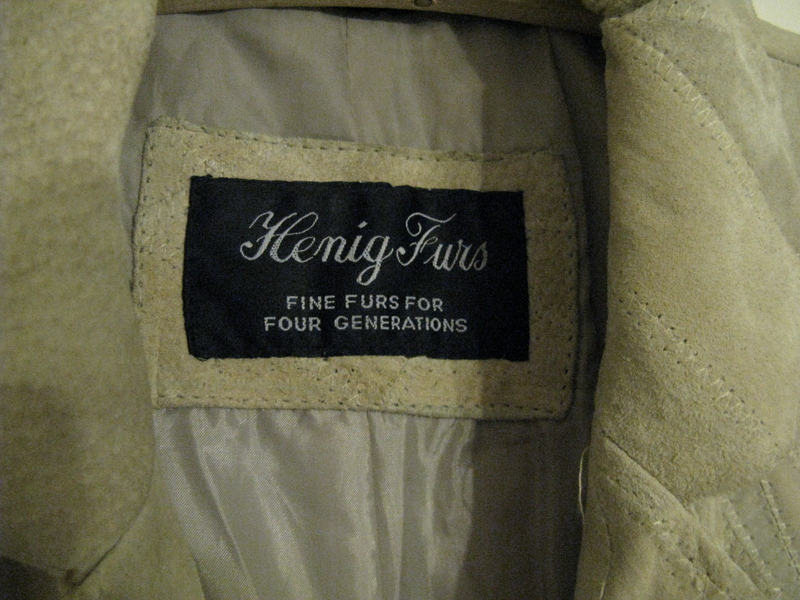 The jacket was to fit snugly, but not form-fitting. 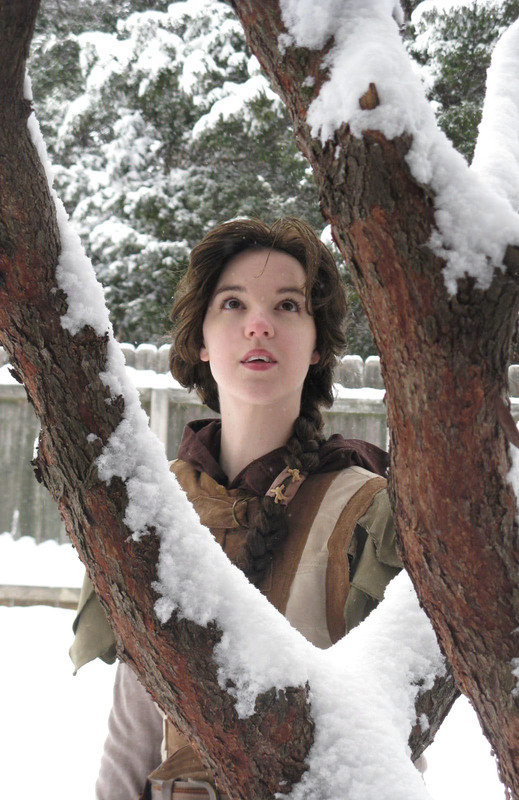 In the beginning of the book, Shannan is still hiding in the woods and attempting to hide herself from prying eyes. This includes hiding her shape to a point to disguise her feminine nature. Now, this was a bit troublesome for me as I am 21 years old and Shannan is 15. As such some of my curves were going to be harder to hide than others. We put the pink pattern over the coat (along with the costume pants and boots, which I’ll be discussing in another post). 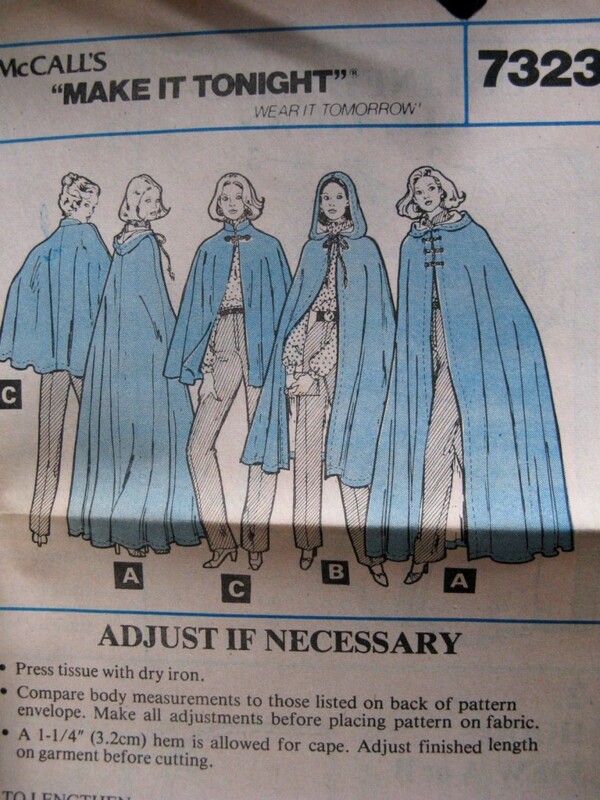 A few weeks later Mrs. Elrod had transformed the cut up Hening coat into the final jerkin, complete with trim, D-rings, straps, shoulder pads (yep,…shoulder pads. 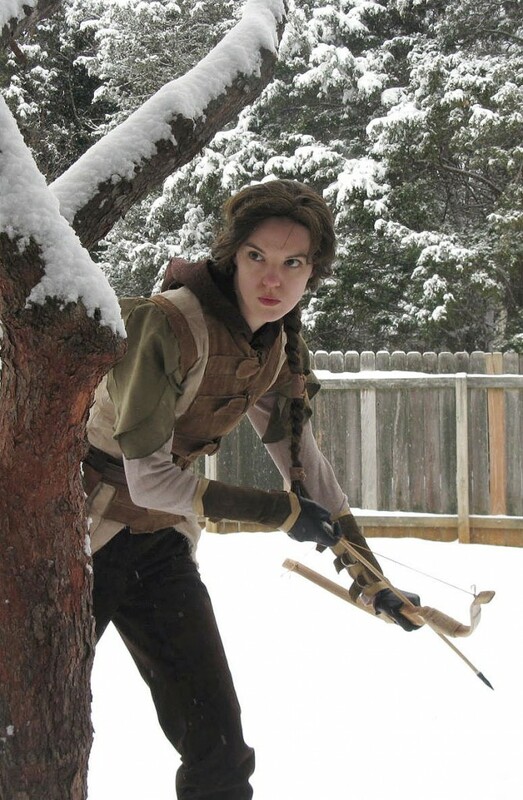 Apparently my shoulders are a littletoo feminine for a strong archer like Shannan! ), and a bum-flap. I hadn’t drawn one in the design, but when we actually looked at it on me, the pattern just didn’t feel right. I’m rather partial to the bum-flap now. It, plus the flaps on each side make the jerkin feel like it has a bit more of a nature-inspired leaf pattern. And here is the final jerkin! Part 3 of the Construction behind my Shannan, the Daughter of Allon costume. 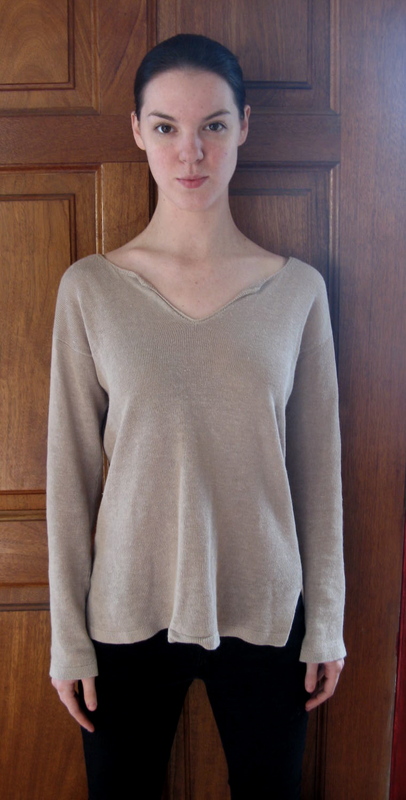 After viewing the sketches, Mom asked for me to combine design #3 and #2 (a simple shirt with the detachable cowl). Sketch #9 was my last attempt to weasal in a double collar. I kept the shirt design simplistic, but with a tapered bottom rather than a straight cut (I find it stays tucked in. With my insanely long torso, shirts coming untucked is a frequent problem). 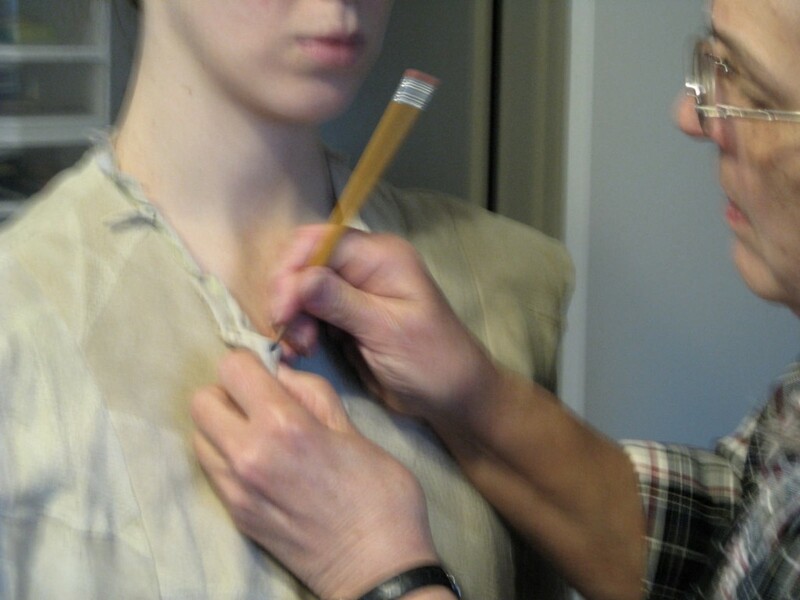 However, the full sketch of the final costume was the death of the double collar as it needed to be a cowl (see previous post on the cowl) and thus I hammered the last nail in the coffin of the funnel collar. Nary did I have a day to sketch a new undershirt before I struck gold in the local Goodwill store. Upon perusal of the racks, I came across a wonderfully rustic looking shirt that was not only my size but 100% linen! Can you believe the tag says it’s a XS from Gap?! 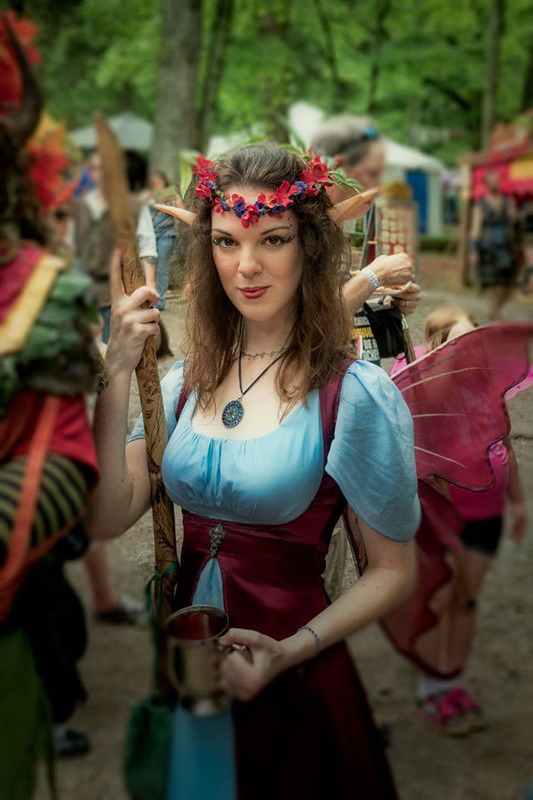 Since I am a linear thinker, I’ll be going from top to bottom in describing the processes that went into building my Shannan costume. So first up is the cowl! 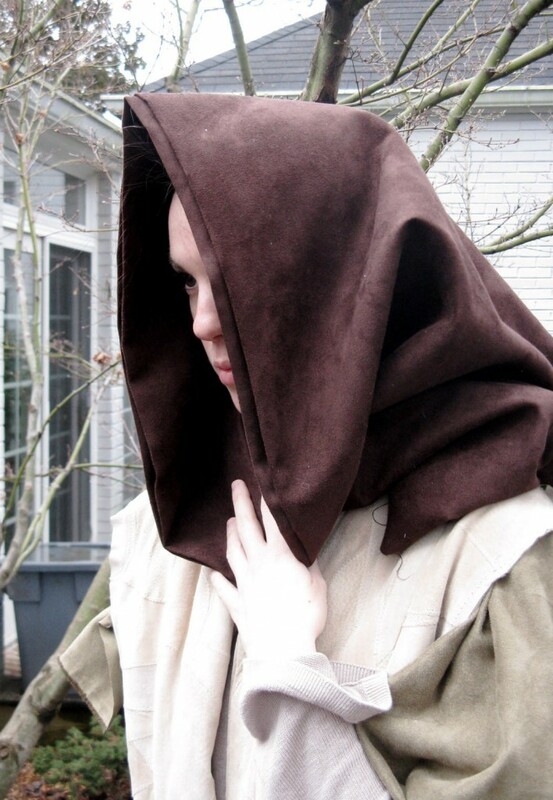 The cowl began with no drawing, but an intense desire to not replicate the typical Robin Hood-esque medieval cowl. I went hunting through page after page of cowl and hood images. 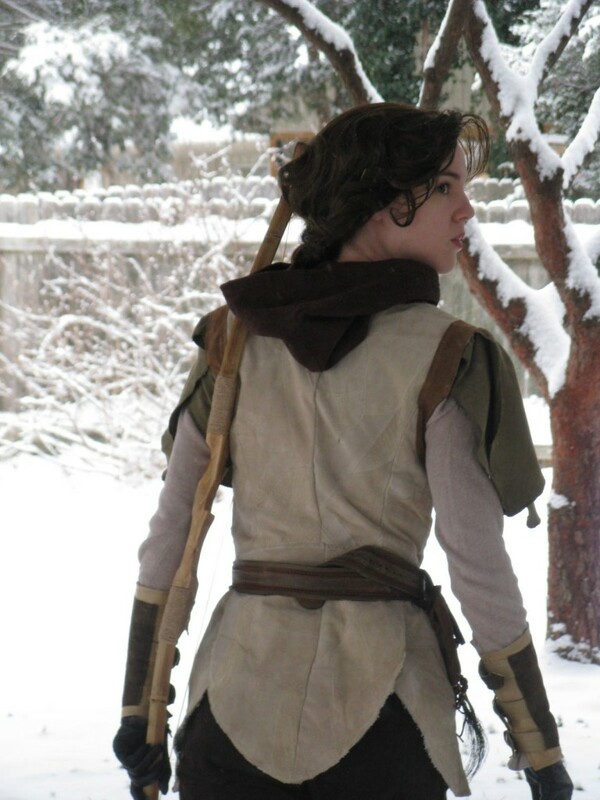 After wanting to throw up my hands from finding nothing but the stereotypical head stockings, I was saved by remembering the top of one my favourite costumes – Altair from Assassin’s Creed. I thought it was perfect with its pointed crest. For Shannon, it could signify her relationship with her other animal companion, the eagle, Kato. 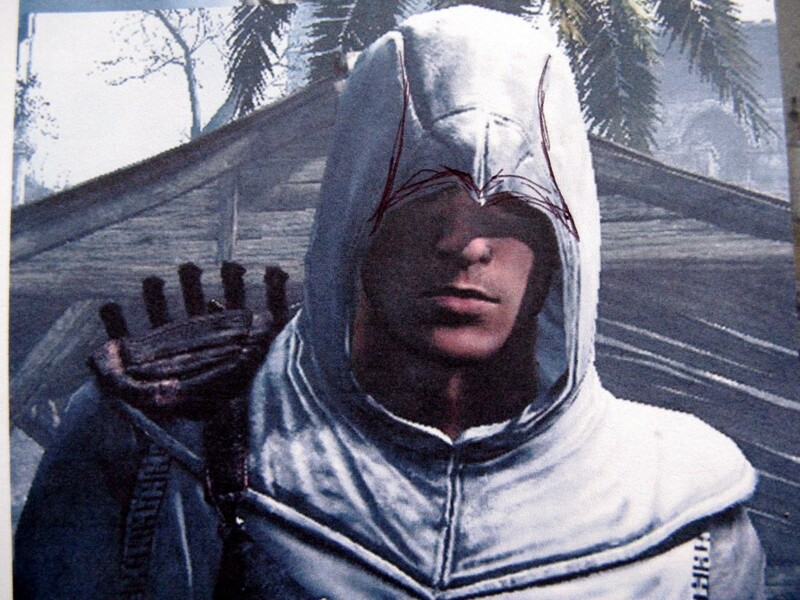 However, I did not want to copy Altair’s hood exactly. 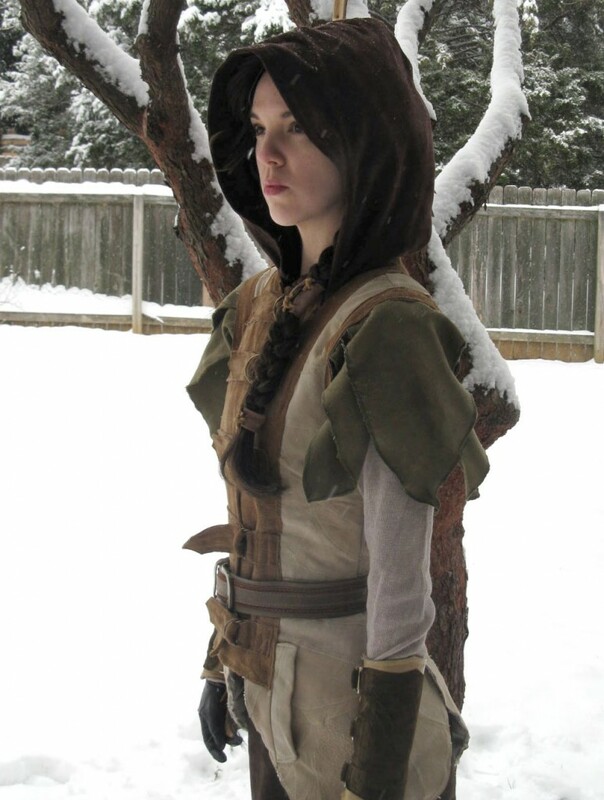 I emailed a few Altair cosplayers to inquire what they used for their pattern. But in the end, they all said theirs’ were custom built. 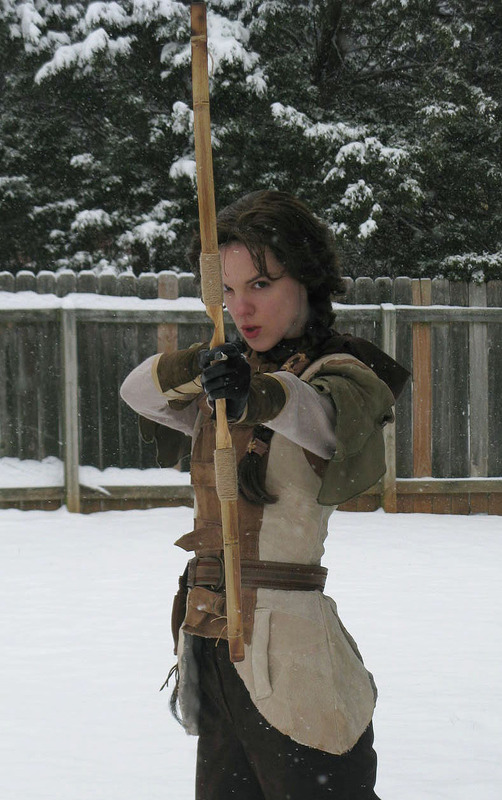 I studied Altair’s overtunic as well as one cosplayer (RBF) from the Netherlands off of thedentedhelmet.com. 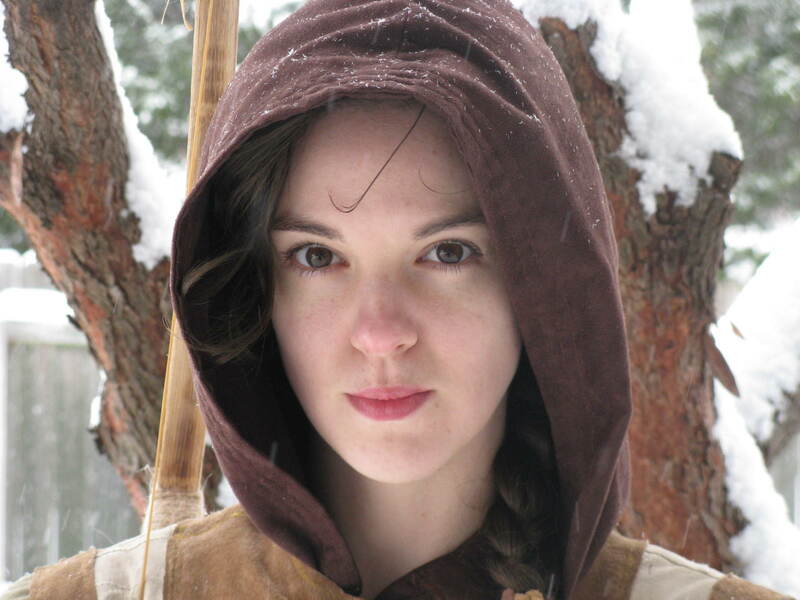 I was given the suggestion of softening the appearance of the cowl to give it more of a feminine look (see above photo). 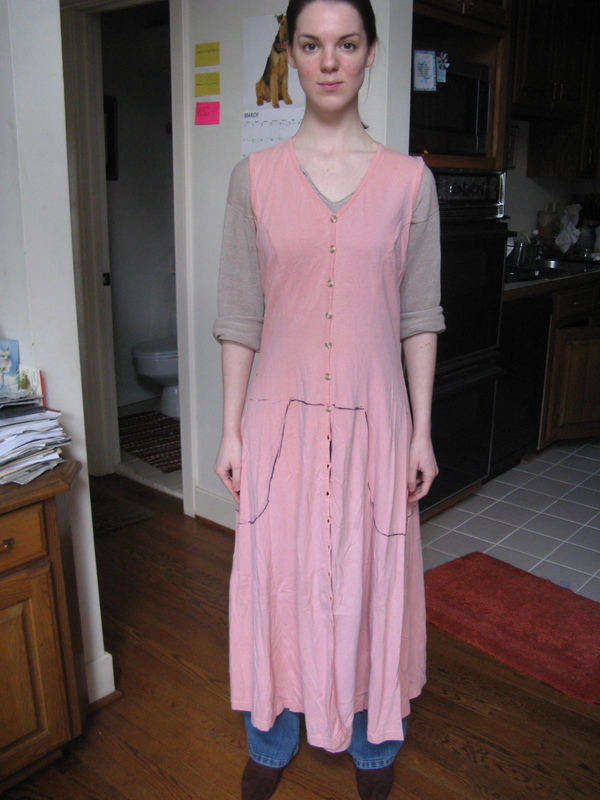 I teamed up with one of my childhood teachers (as sadly, I can’t sew to save my life. *gasp! * I know…sad, but true. I’ve tried for years, but alas, I’m known more for being the Grim Reaper of sewing machines than anything else. 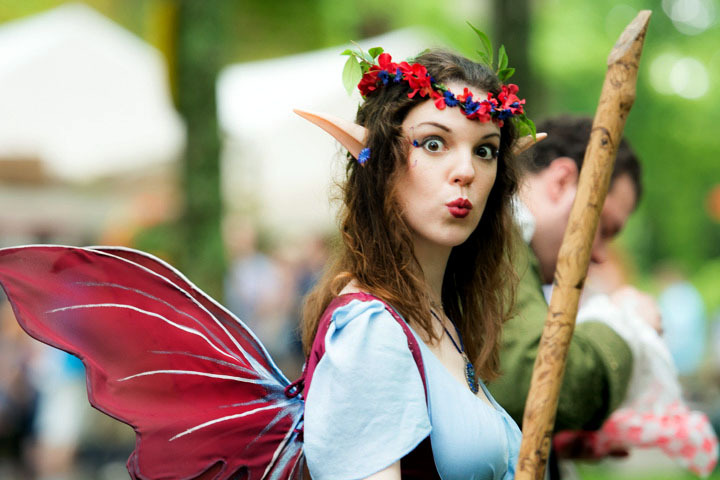 So I do what I do best (design, research, helping with side tasks, photoshoot planning, final modeling, and promotion) and leave the sewing and prop-making to those more experienced). 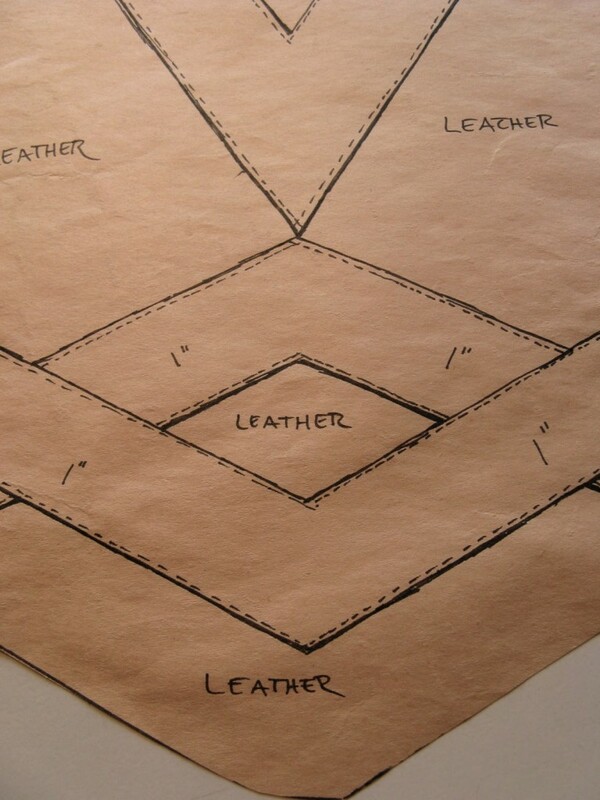 For the construction of the pattern, we knew we were going to have construct our own. 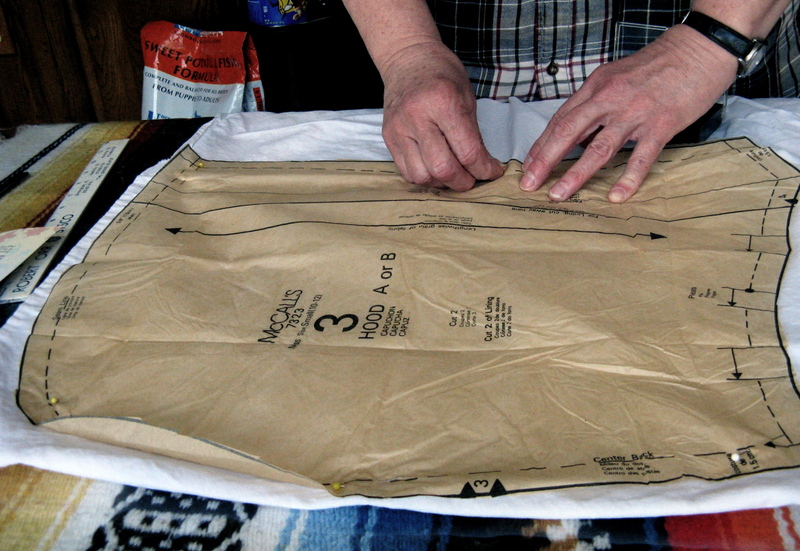 We started with McCall’s 7323 as a base. 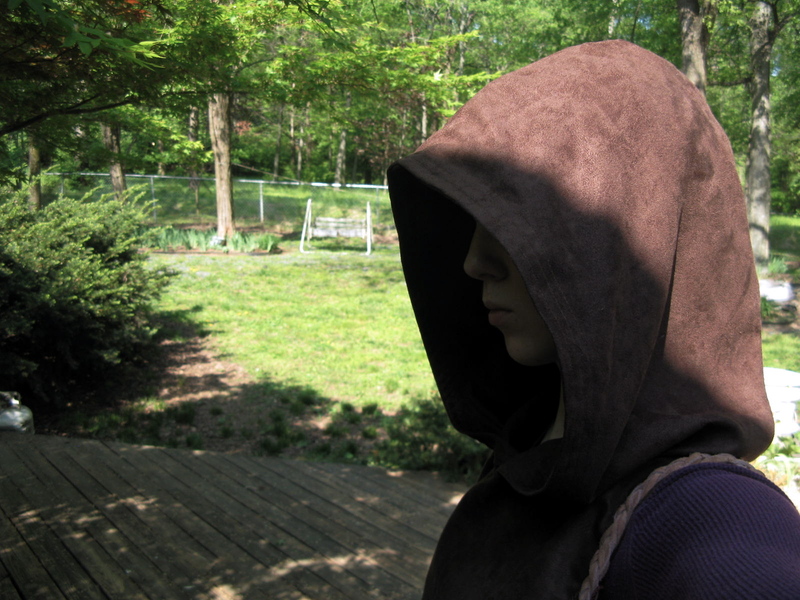 The bottom was measured a bit wider as to widen out the base of the cowl for the fabric to lay in softer folds in contrast to the sharper angles in Altair’s hood. 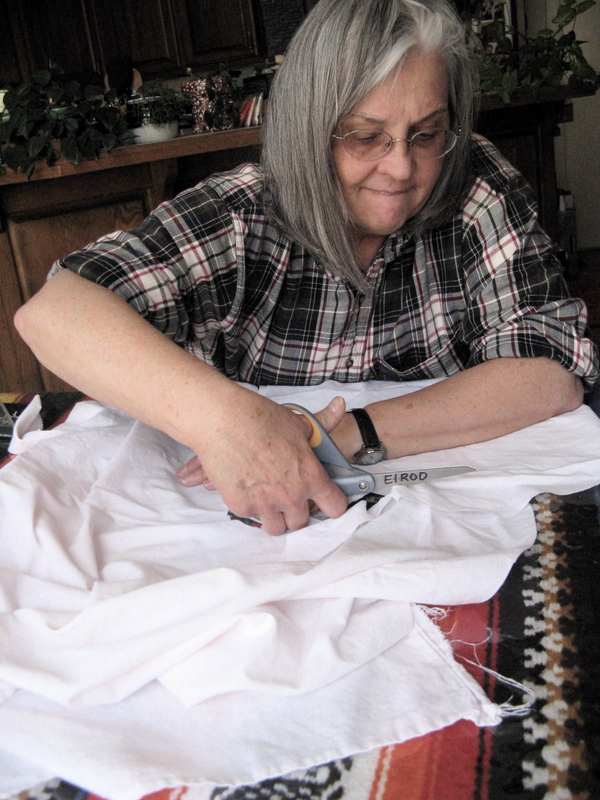 Mrs. Elrod took the earlier head measurements and measured out the pattern to cut and pin to an old bedsheet. 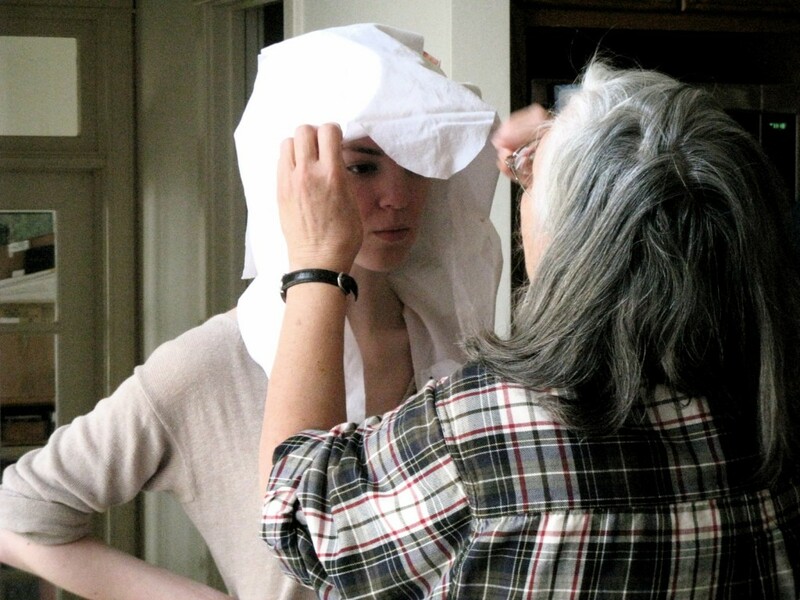 We then pinned said bedsheet to my head (to my head, not in! Pinhead, I am not). Stick me and we’ll see who has the last laugh…my face seems to say. 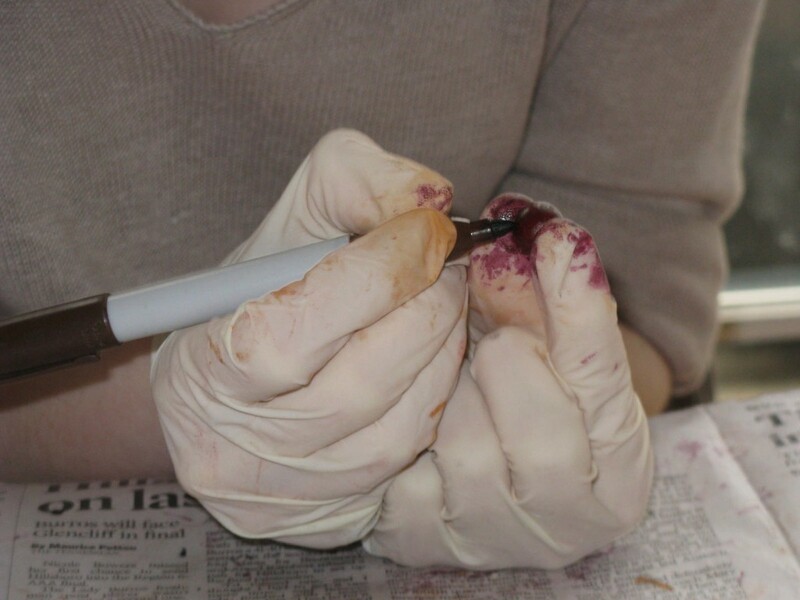 We cut a ‘beak’ in the form of a half-shield to go on top of the head. At first it was cut too long (it covered the back of the head from the hairline to the nape of the neck). So snip snip snip went the scissors and chopped the beak in half. Then the beak ended at the back top of the head. 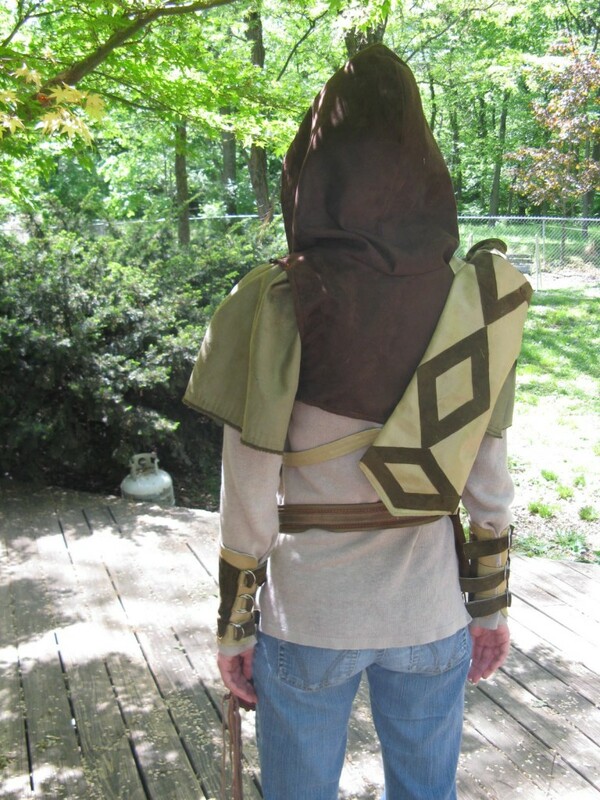 Now the problem with cowls, as I’ve been told by fellow costumers, is that they have a fondness for moving around. 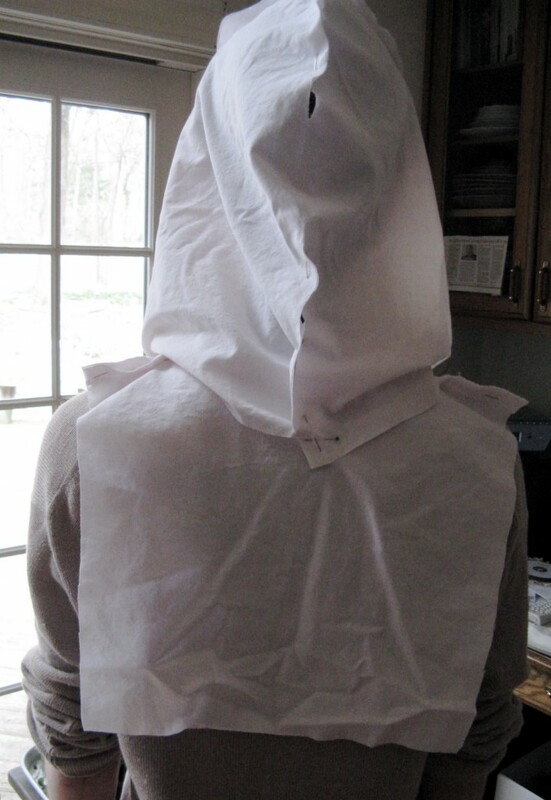 Rather than seeking a modern way to secure the cowl (such as velcro), we opted to create a sort of half-shirt/bib to attach the hood portion to. 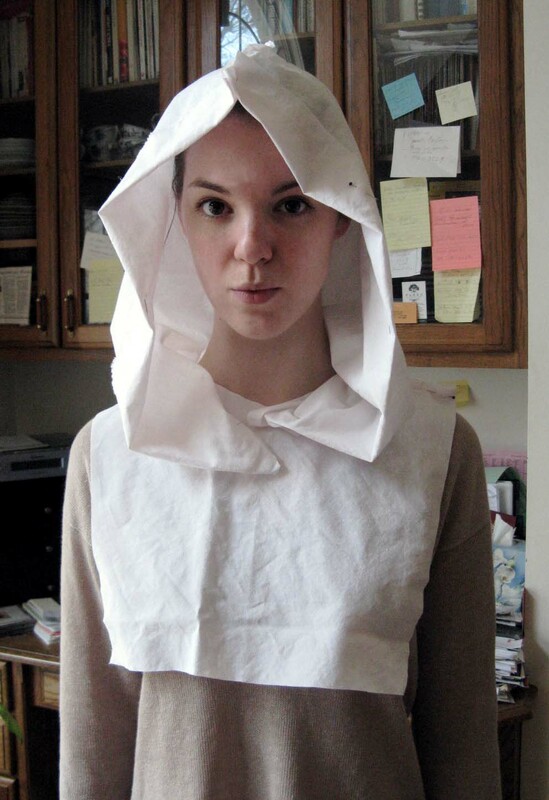 The top of the bib rounds out in a simple yoke. In one of our thrift store runs, Mrs. Elrod and I swung by Hobby Lobby to check out the fabrics. Although I wanted to stay away from modern fabrics as much as possible, we couldn’t find any fabric that would be both light and have give to drape into the folds we wanted. So we compromised with a dark brown poly-suede. Hmm….feeling a little ‘dark-side-of-the-Force’ here…. 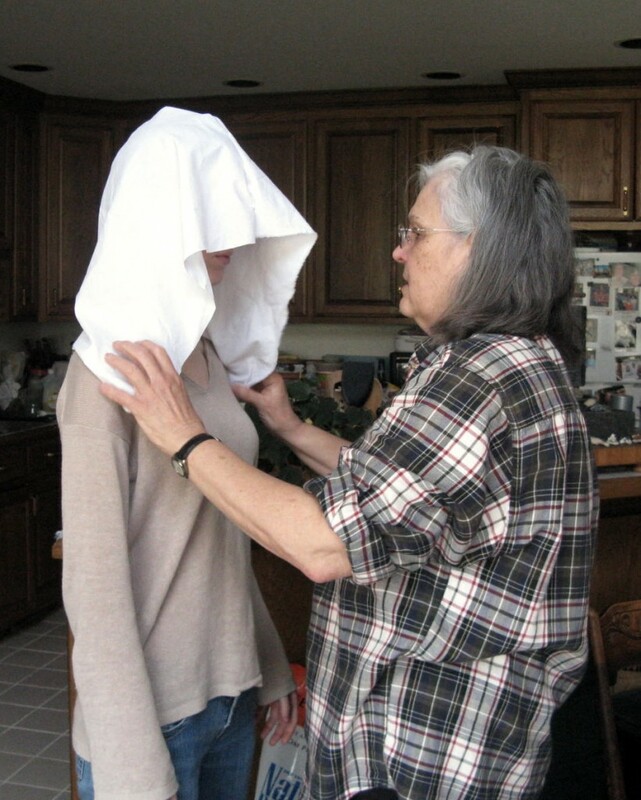 After Mrs. Elrod cut and sewed the cowl together, I came over for a fitting. 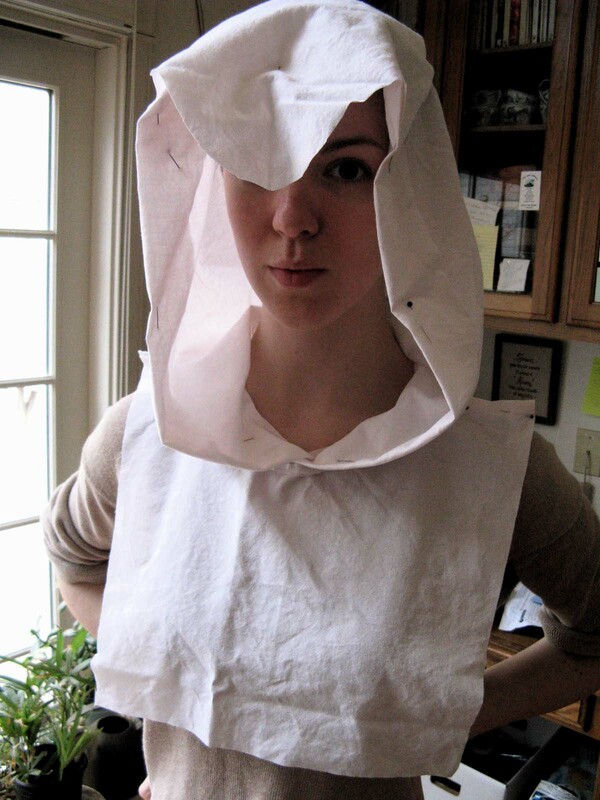 While the longer t-shirt style yoke was definitely the right idea for keeping the cowl from popping out of the jerkin, there was still the issues of how to keep the bottom from flopping around. 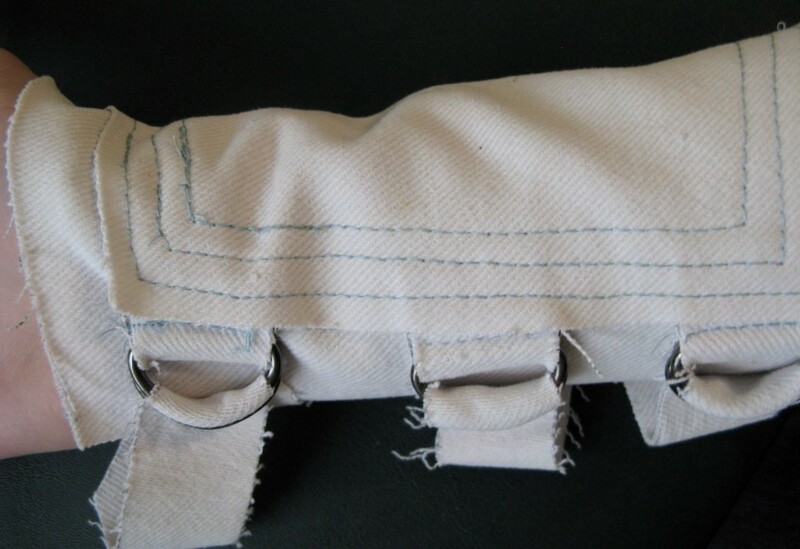 So we opted to attach ribbons of the same fabric to the four corners and pull them through D-rings like a belt. About a week later, the cowl was finished. (We ended up chucking the Assassin’s Creed beak as it was proving to be too much hassle for the rest of the design we had done.) So here is the final cowl! Stay tuned for the next part of the costume!